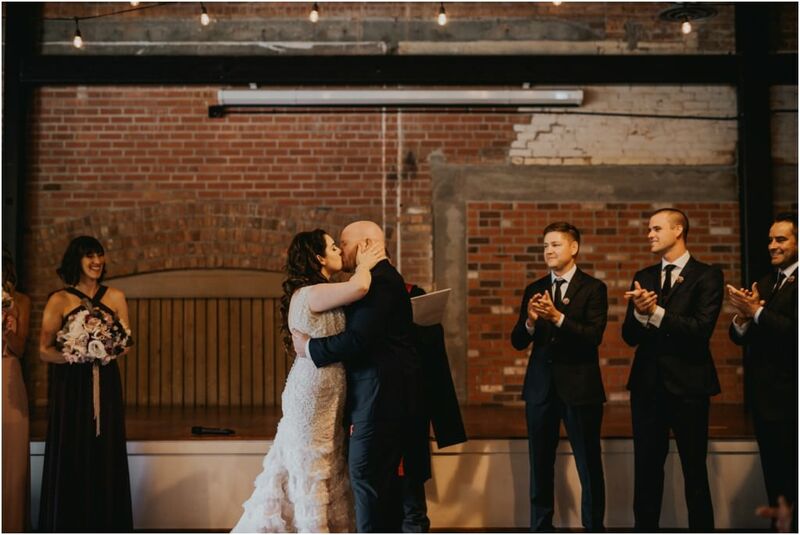 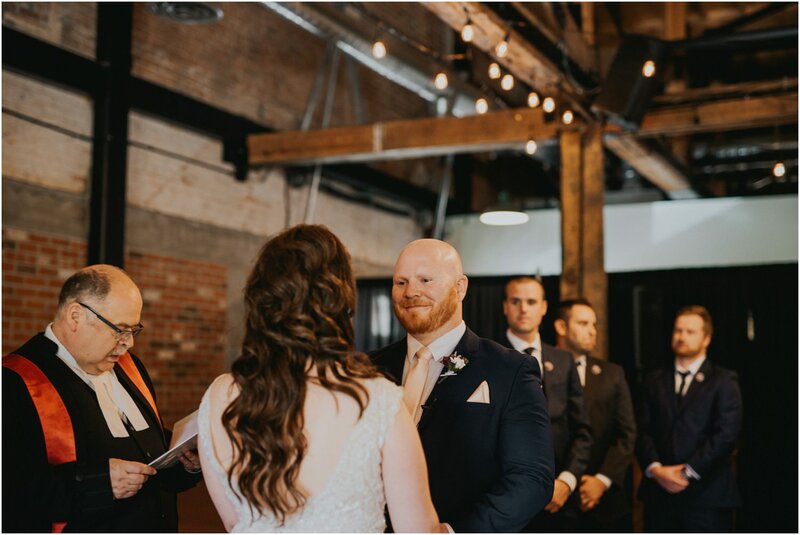 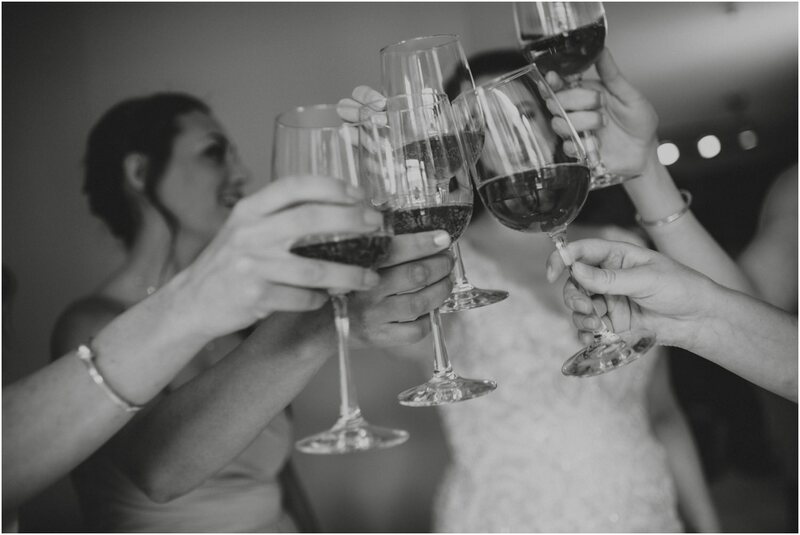 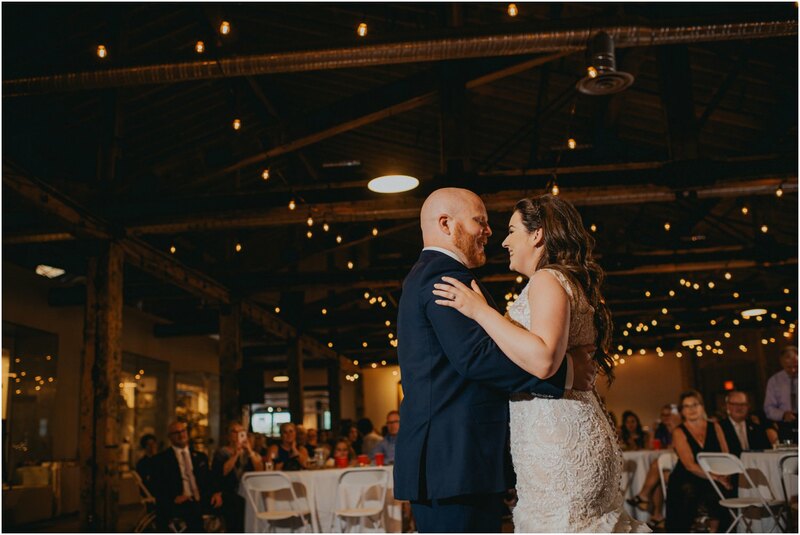 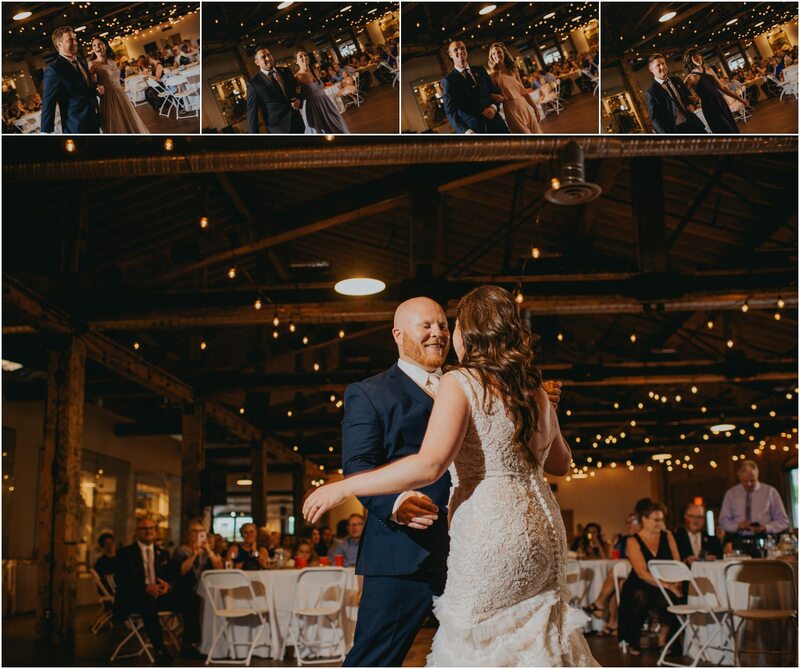 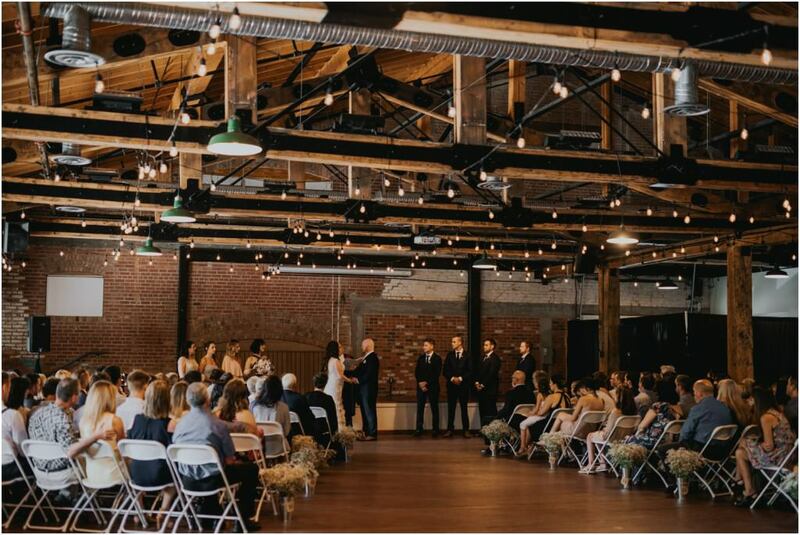 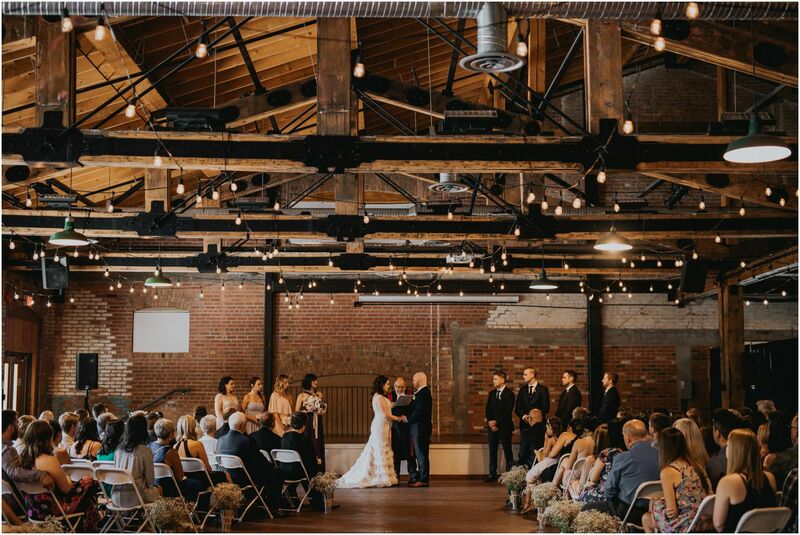 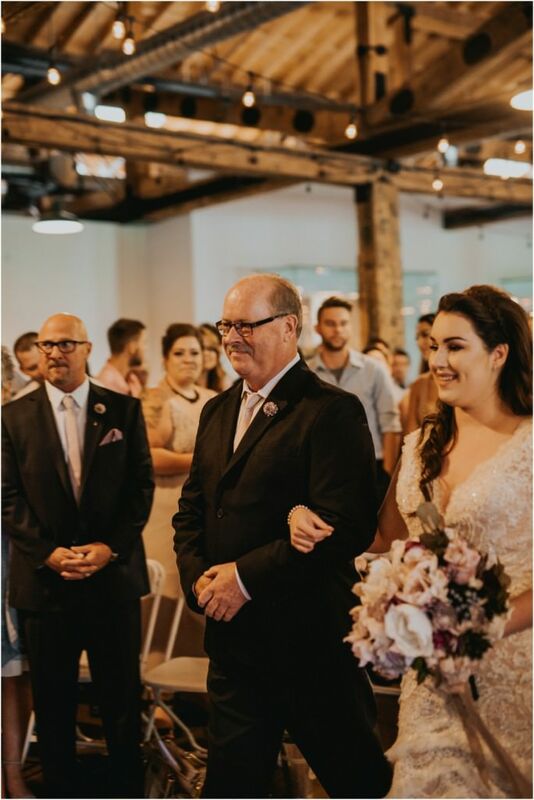 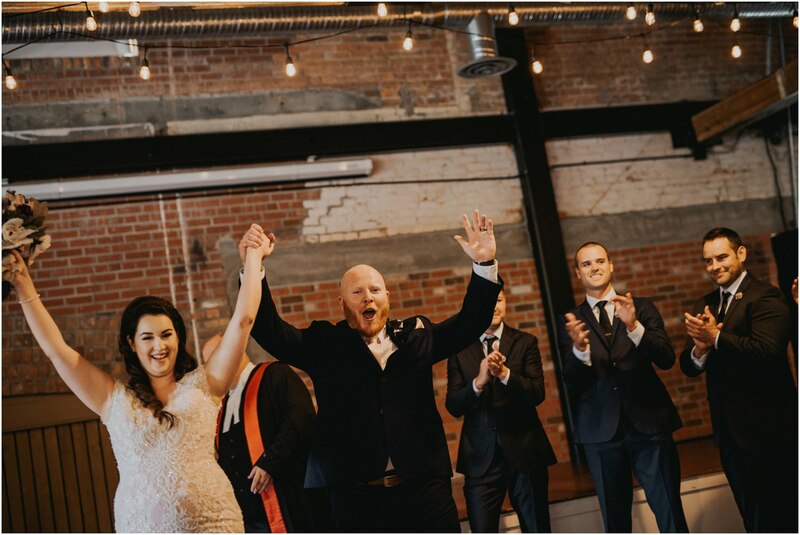 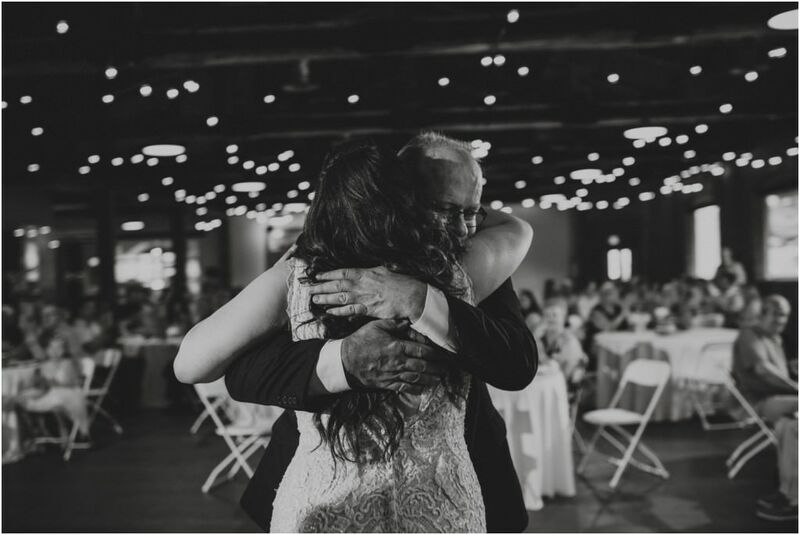 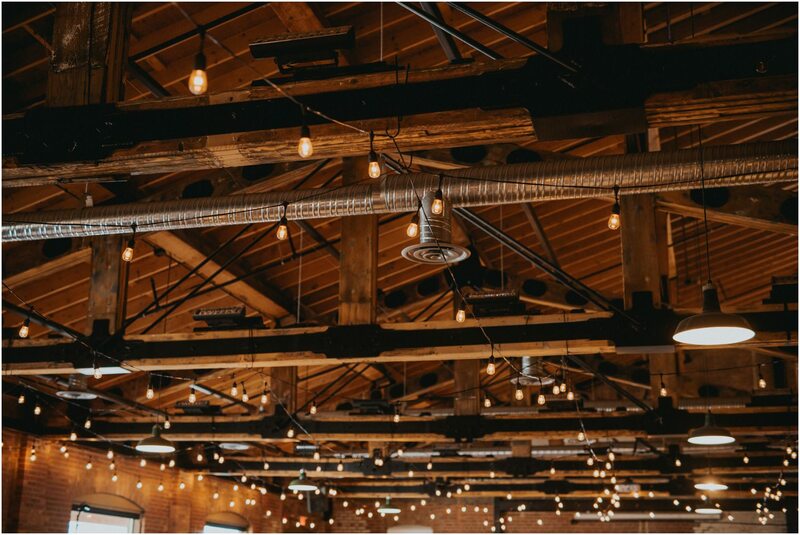 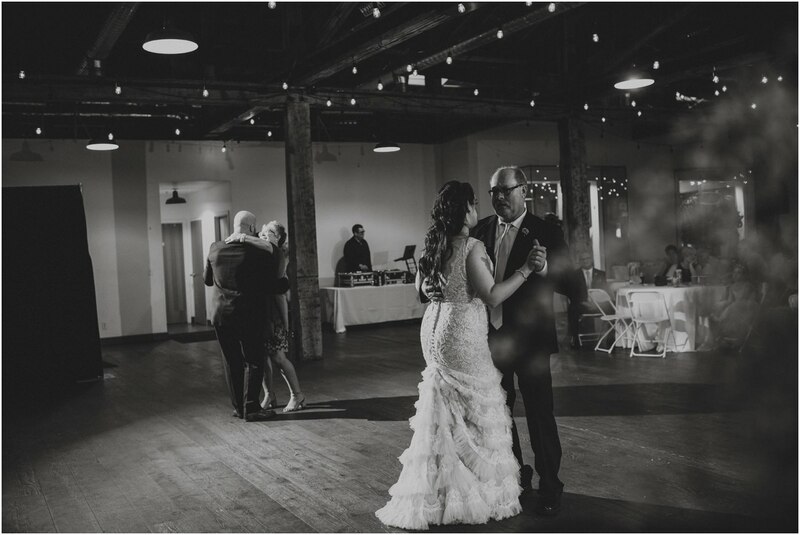 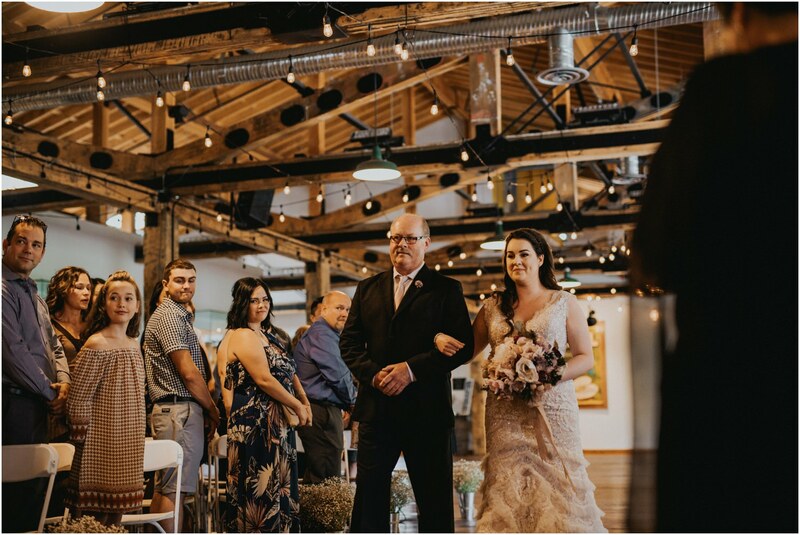 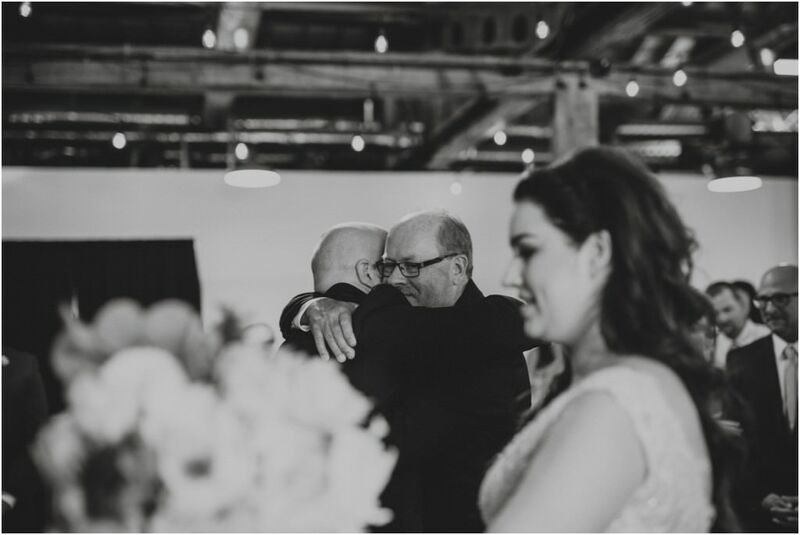 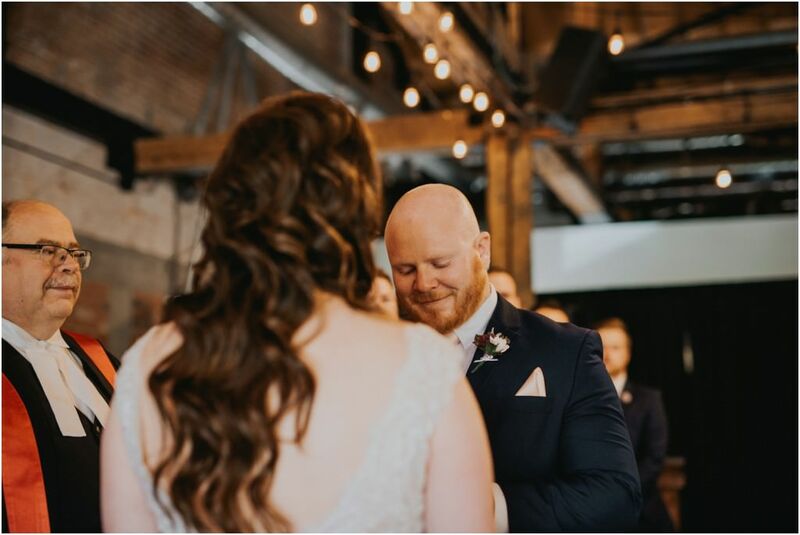 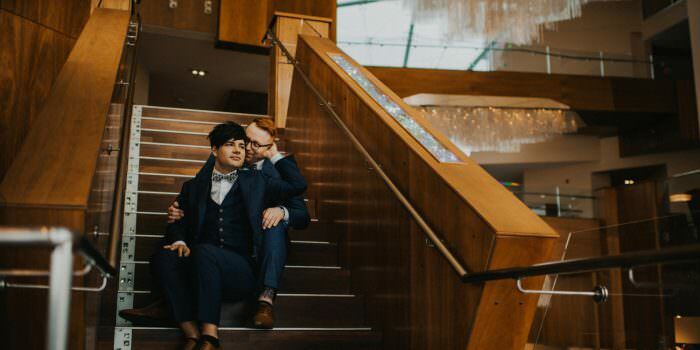 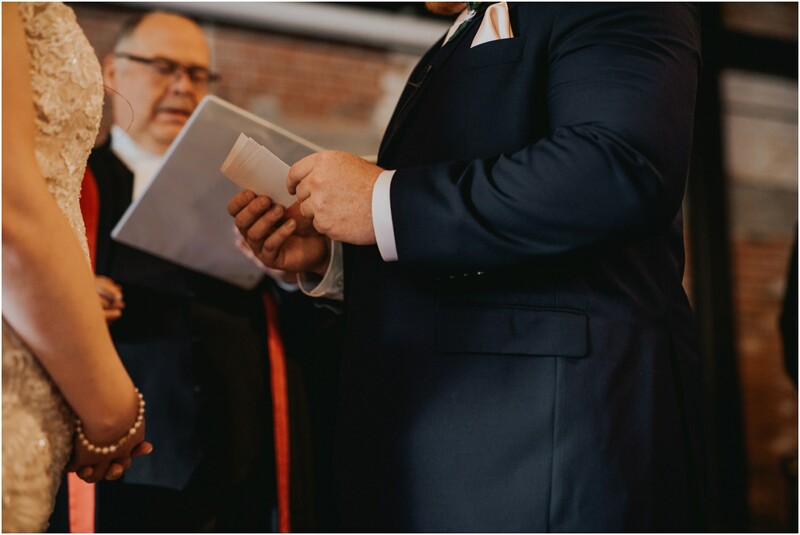 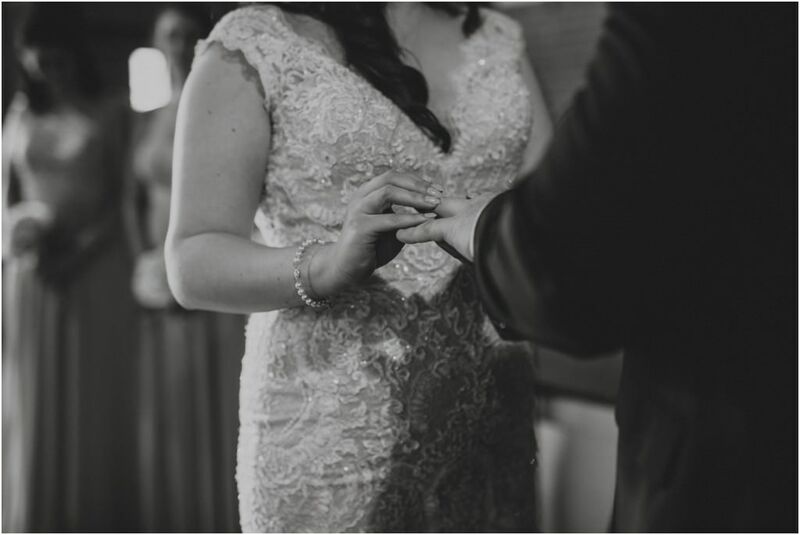 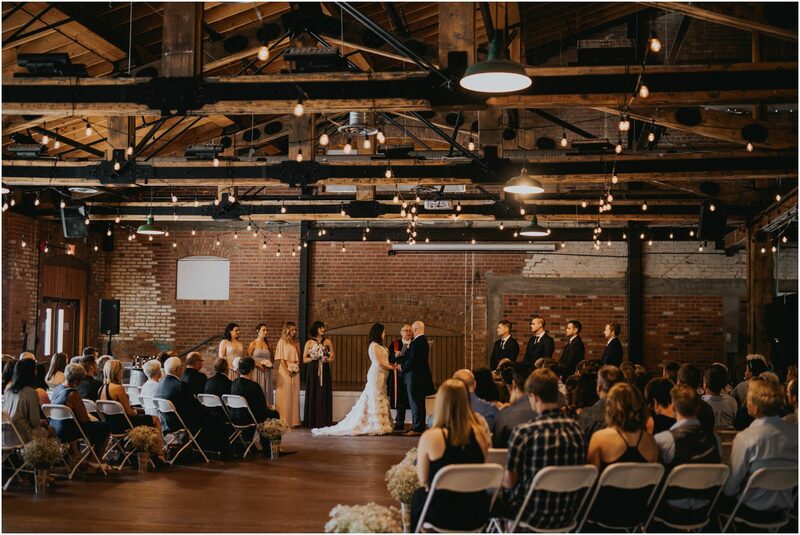 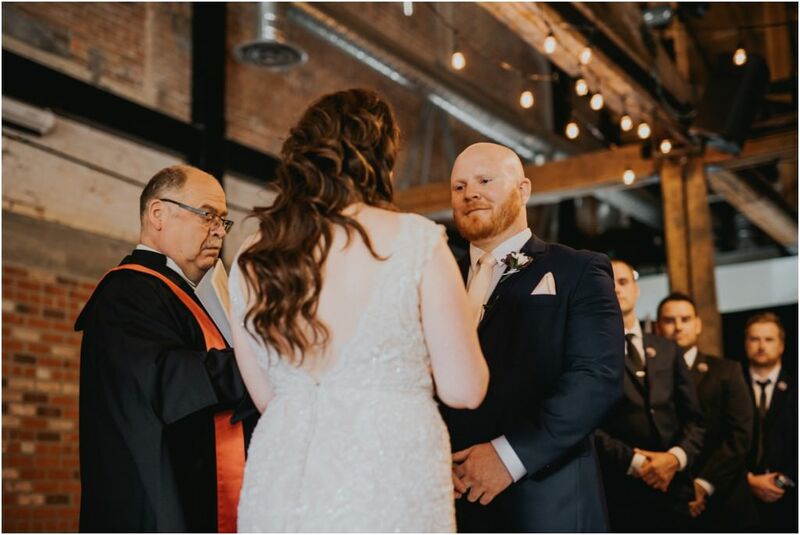 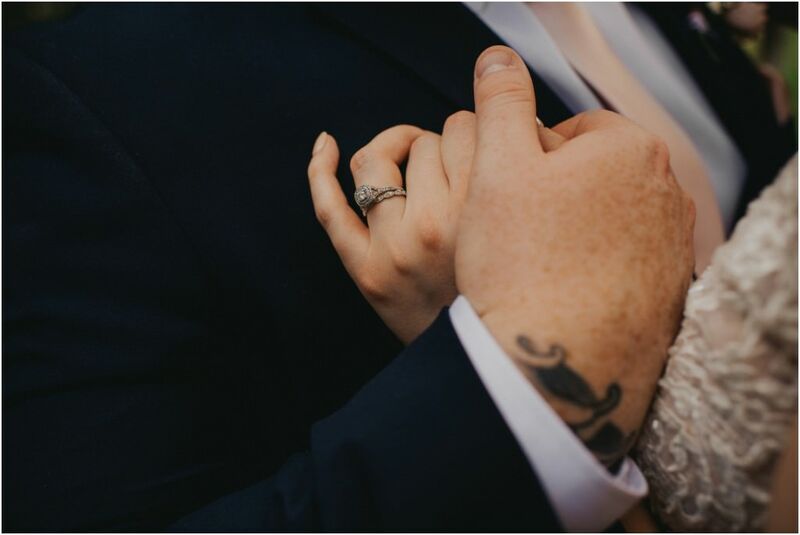 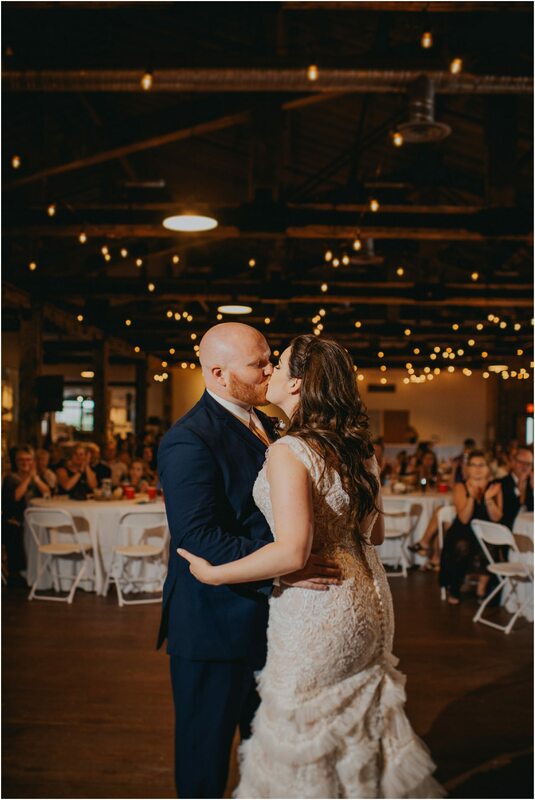 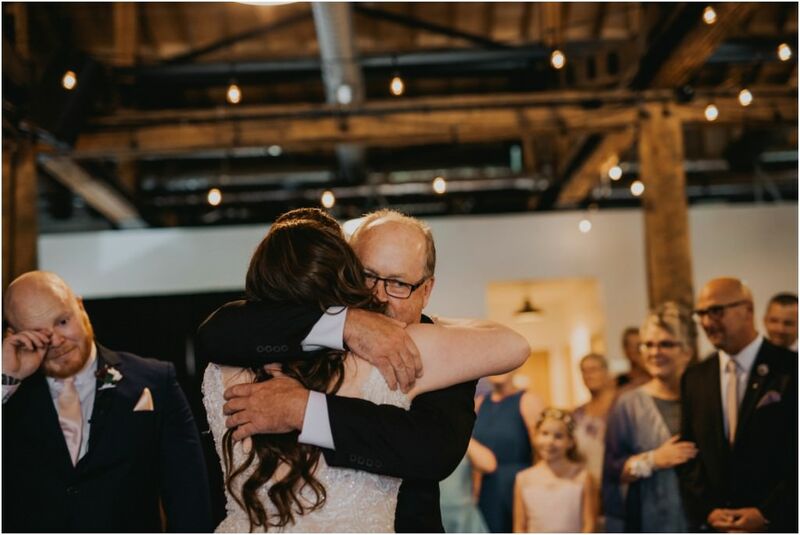 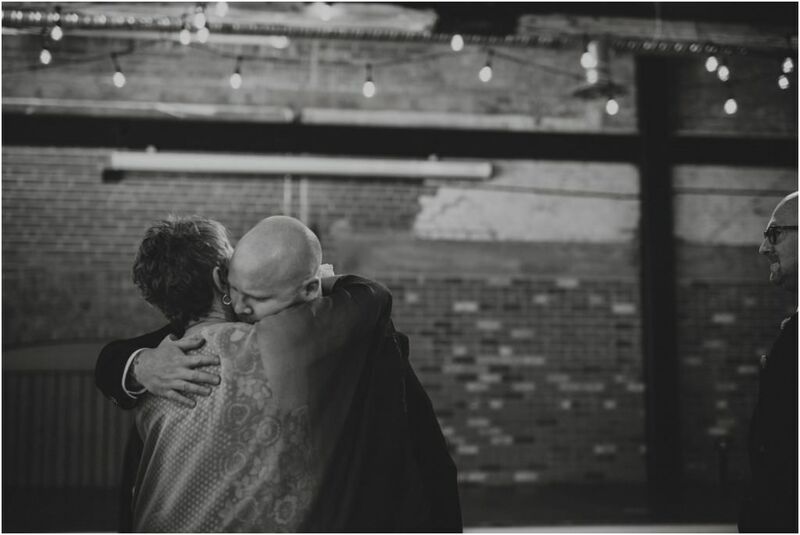 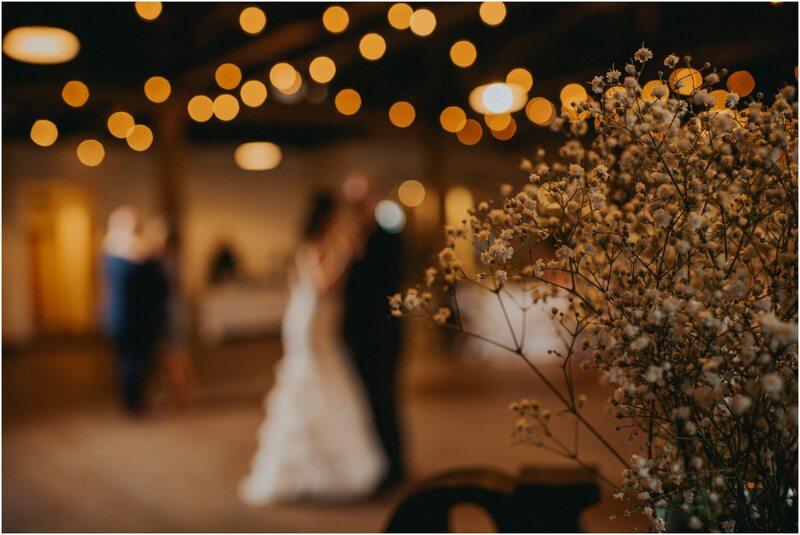 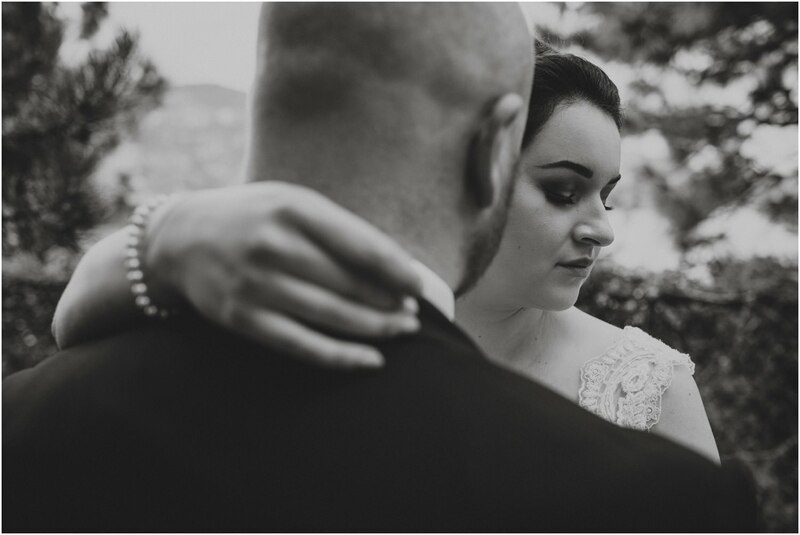 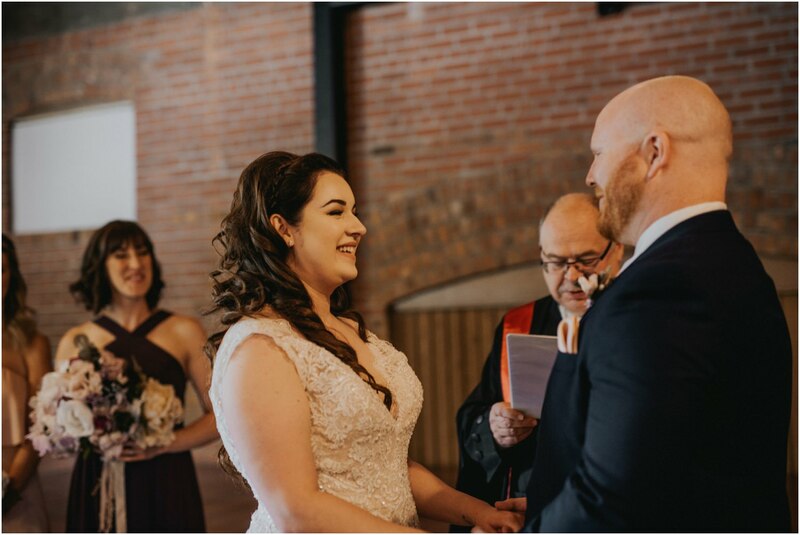 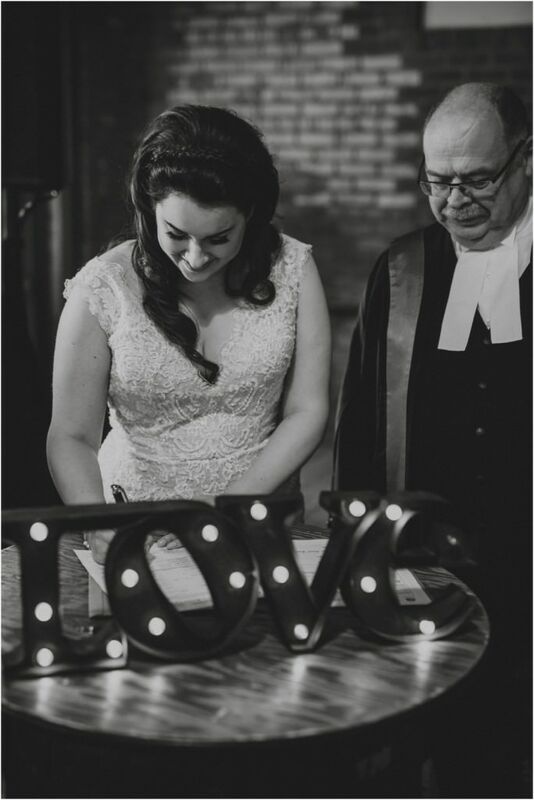 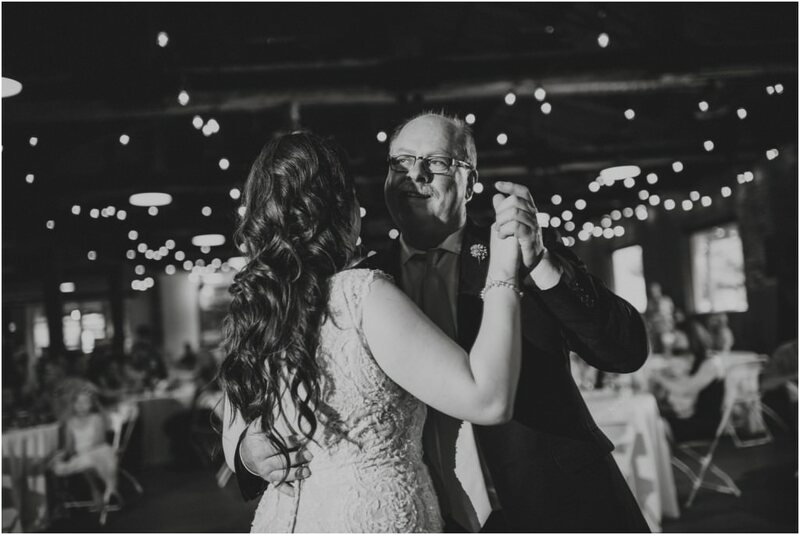 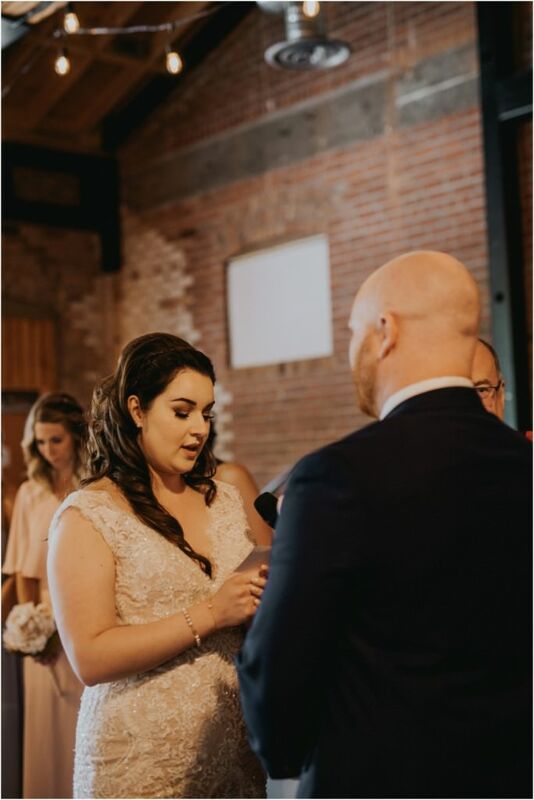 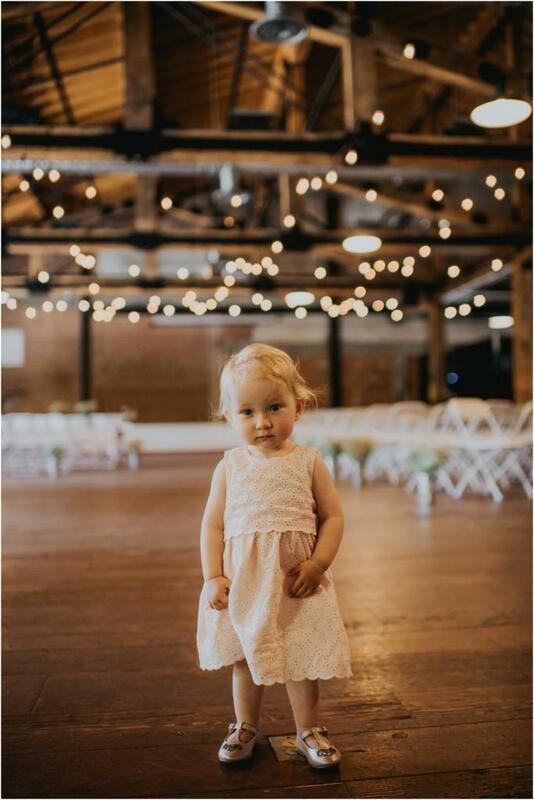 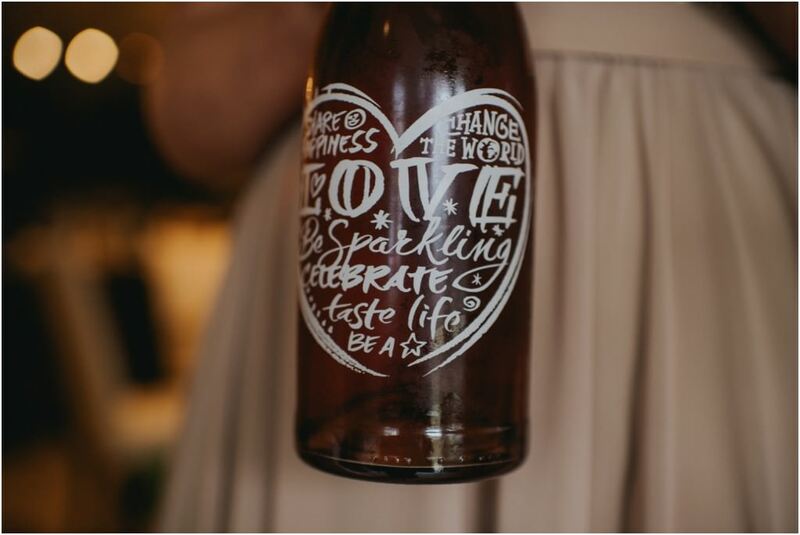 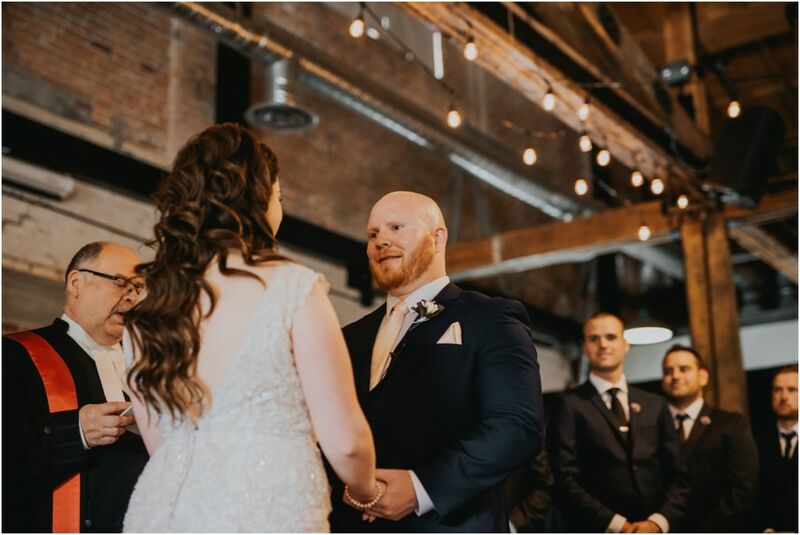 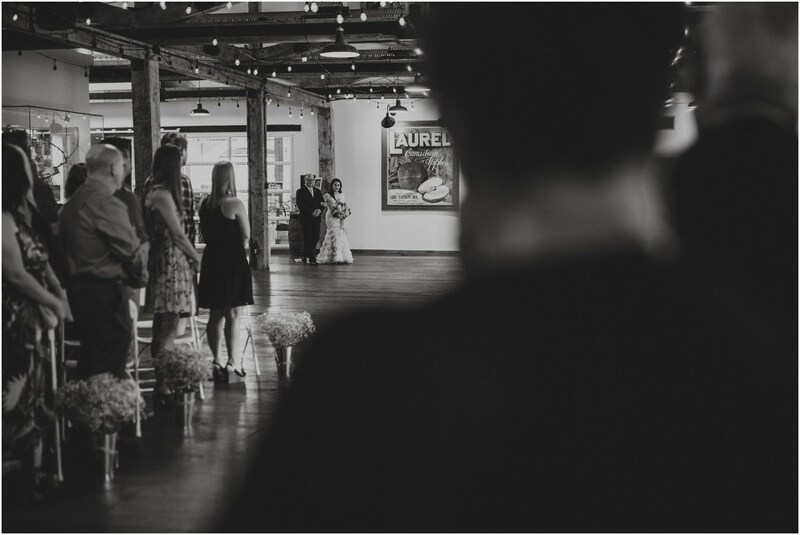 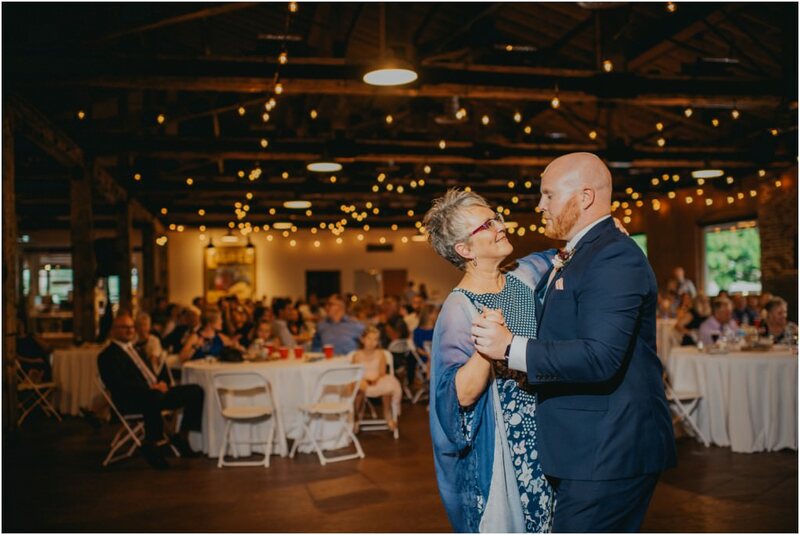 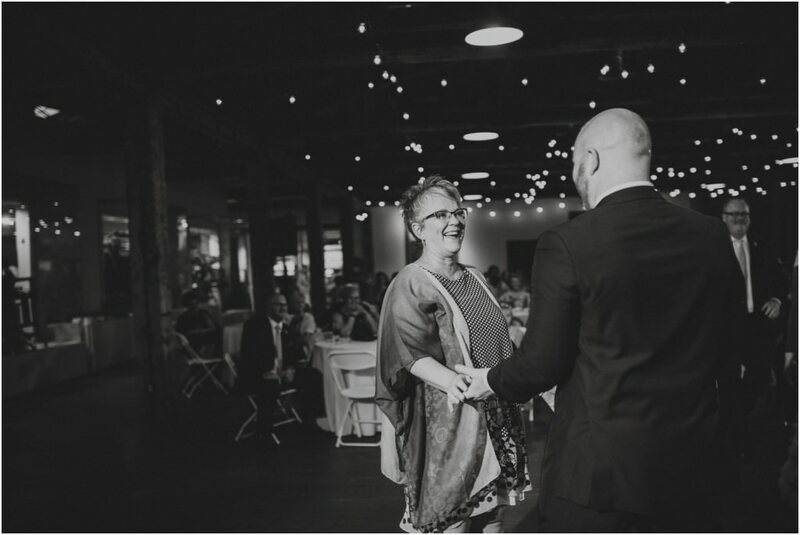 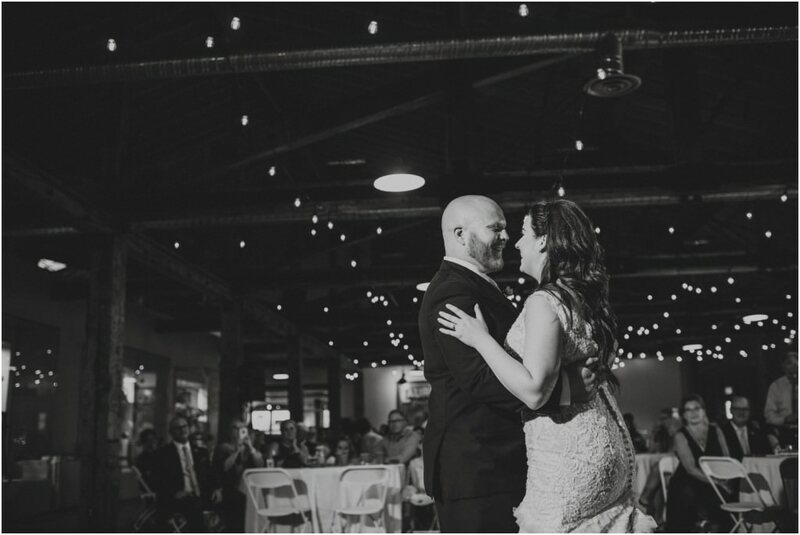 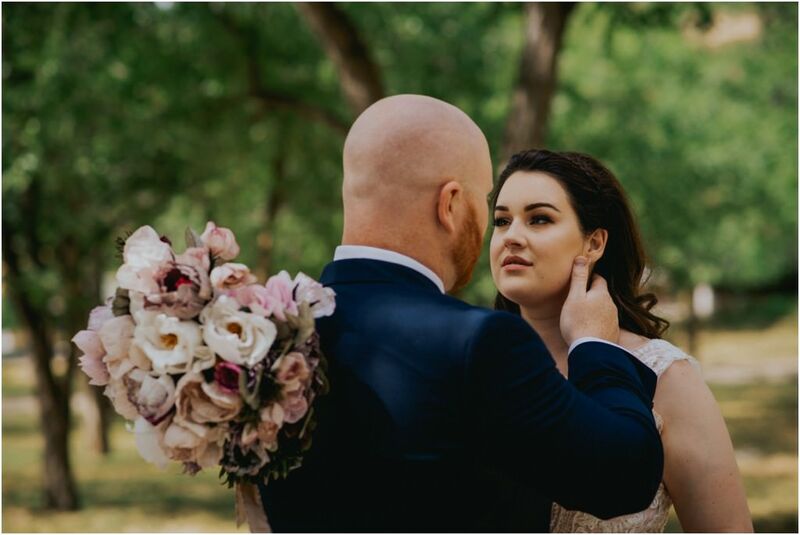 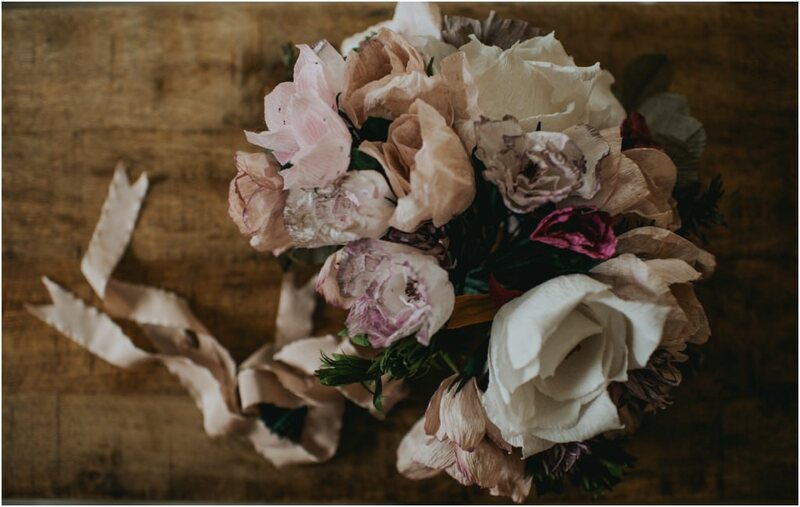 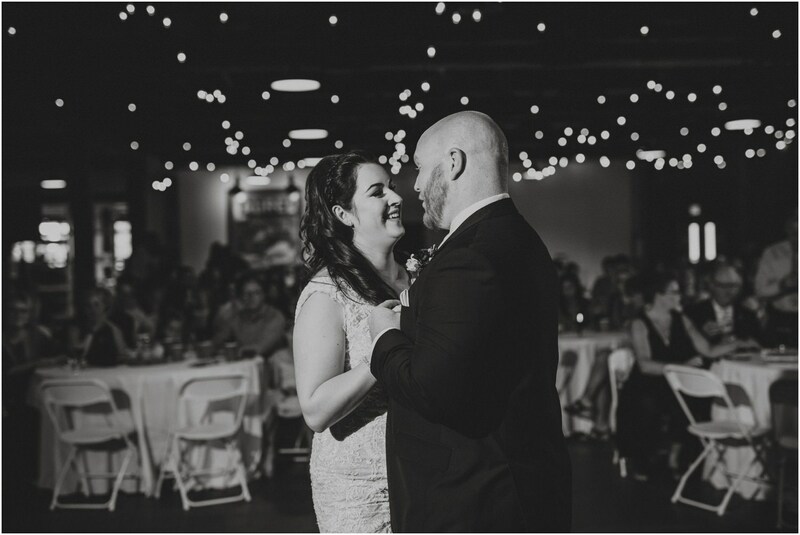 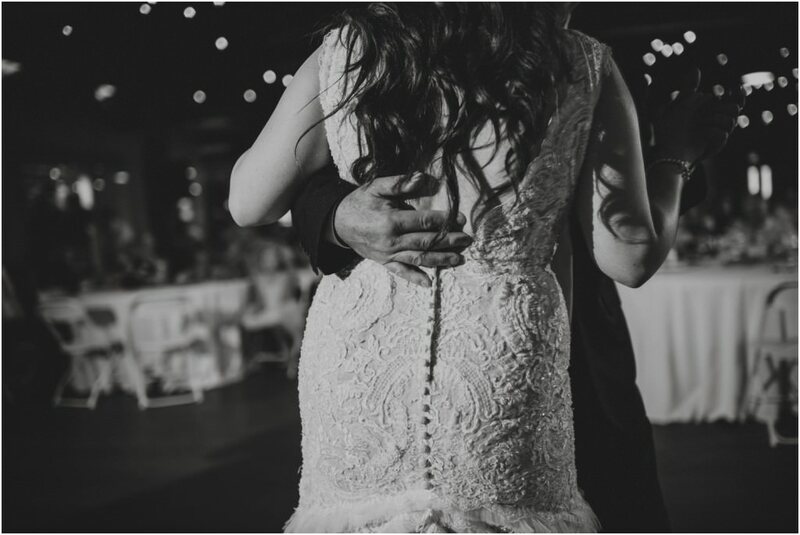 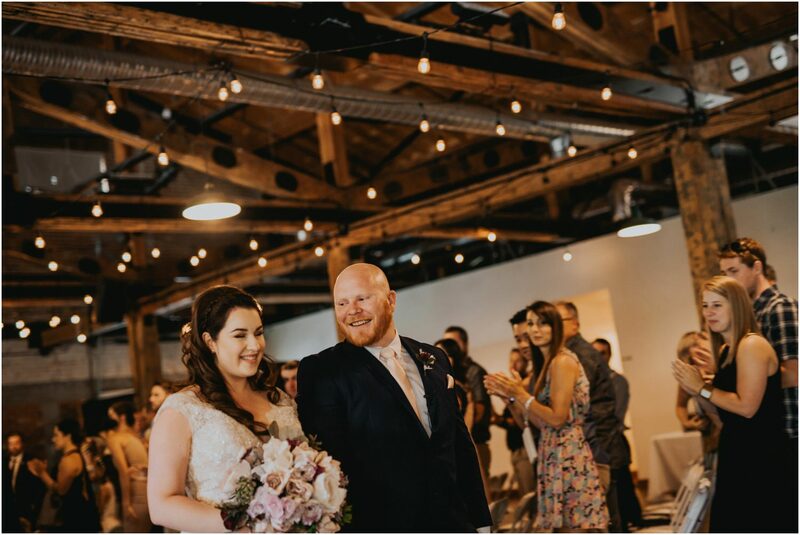 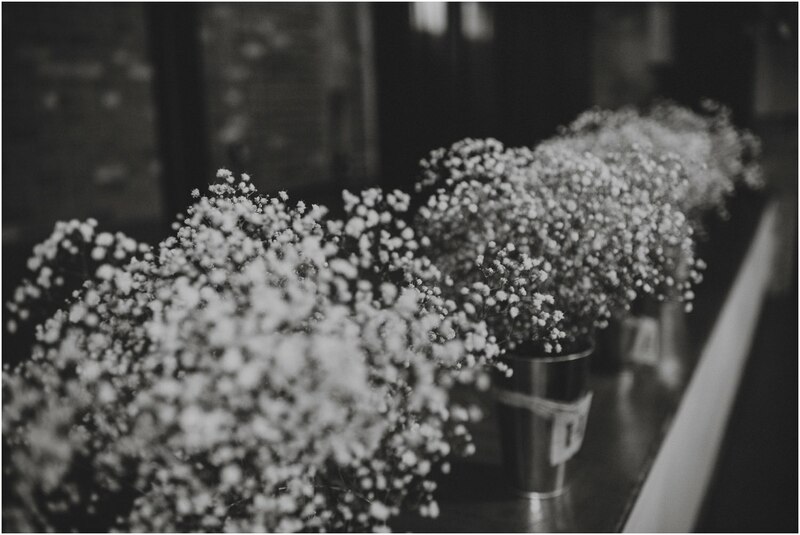 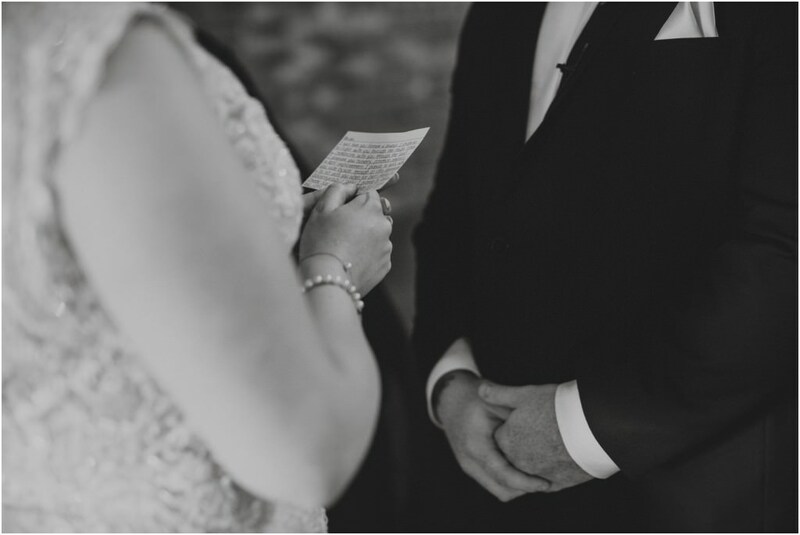 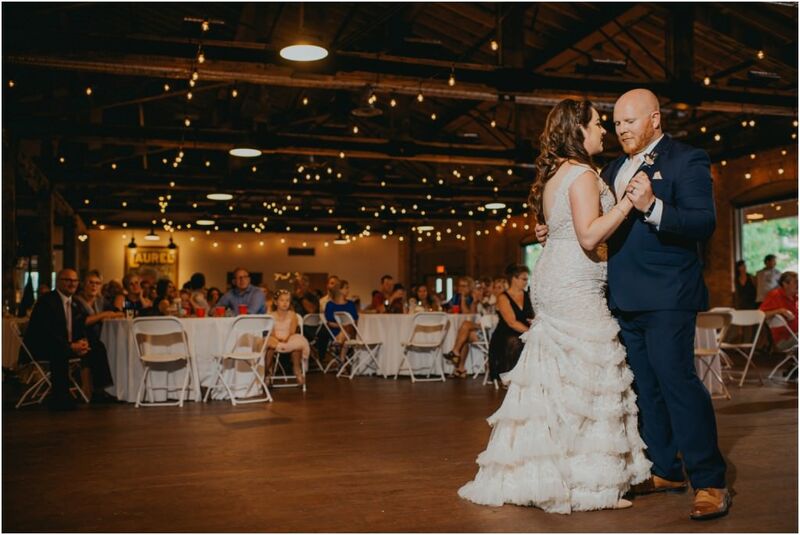 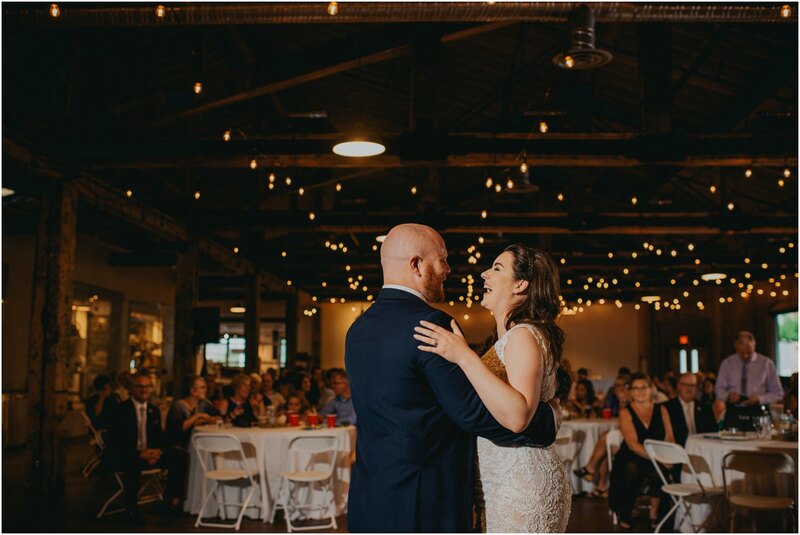 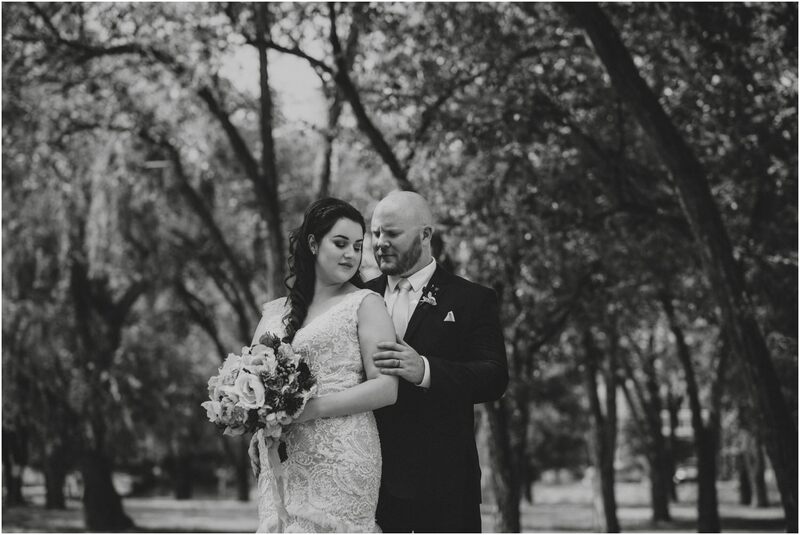 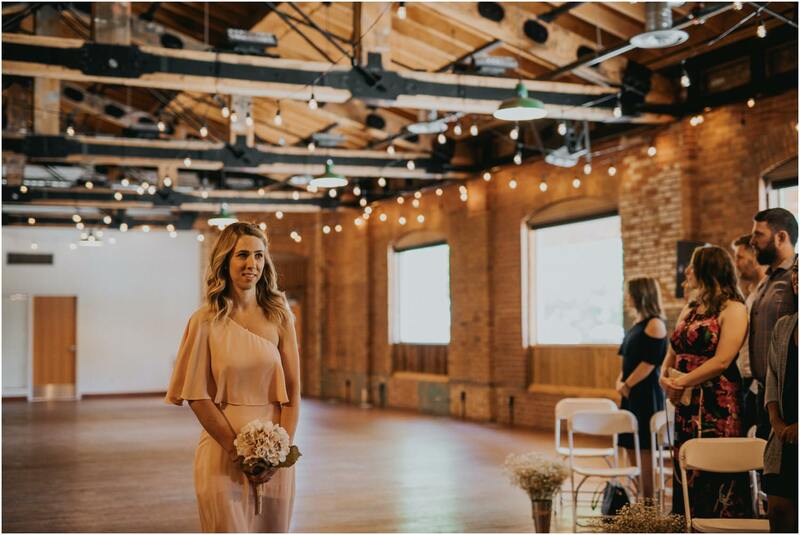 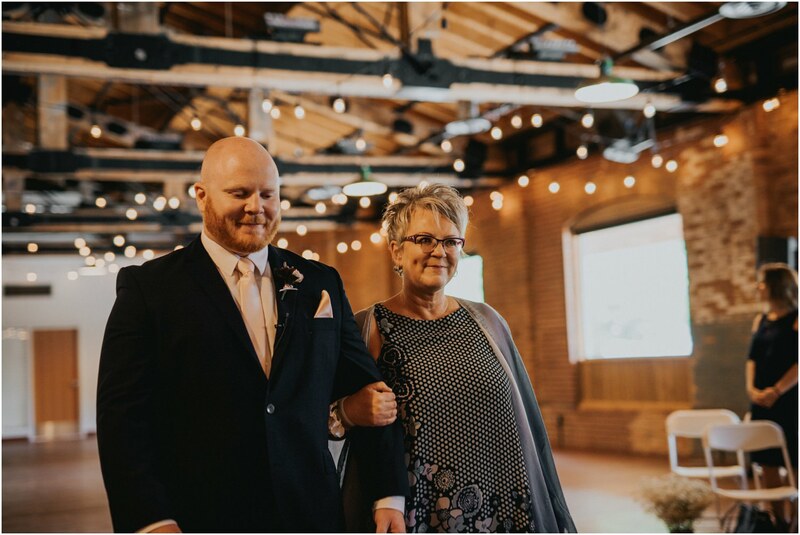 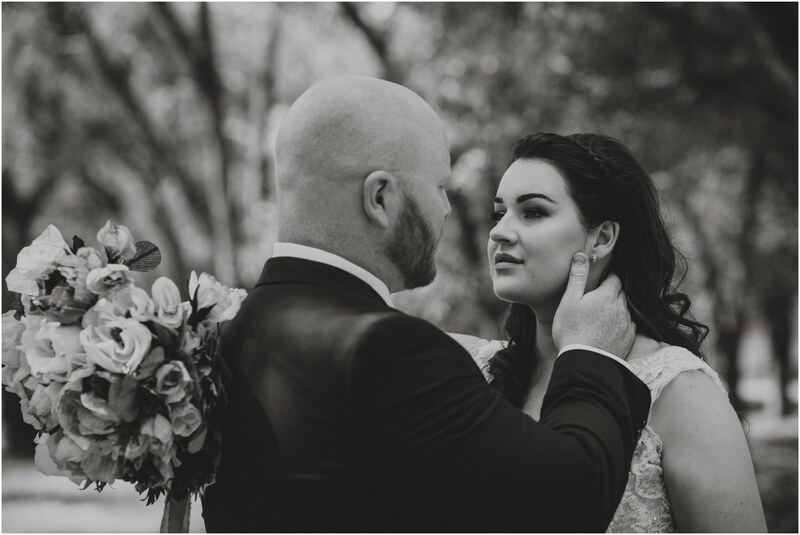 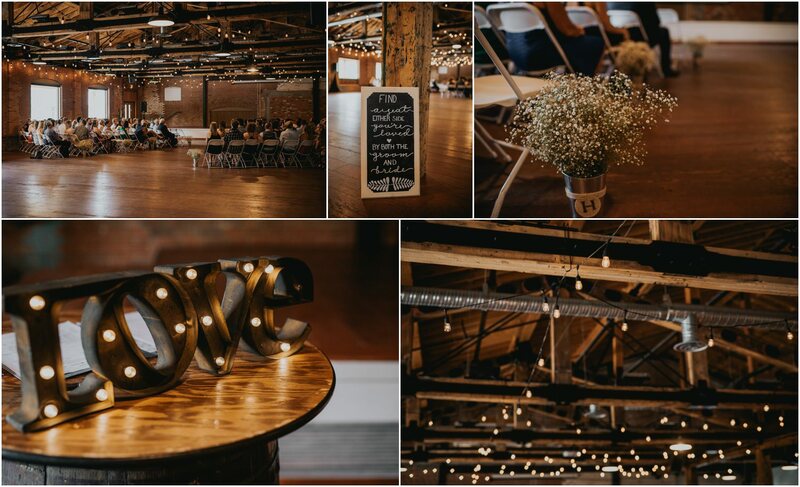 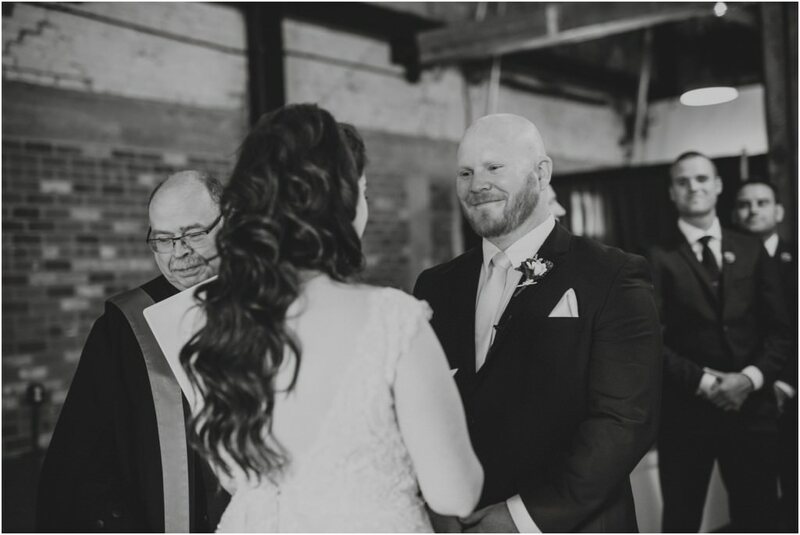 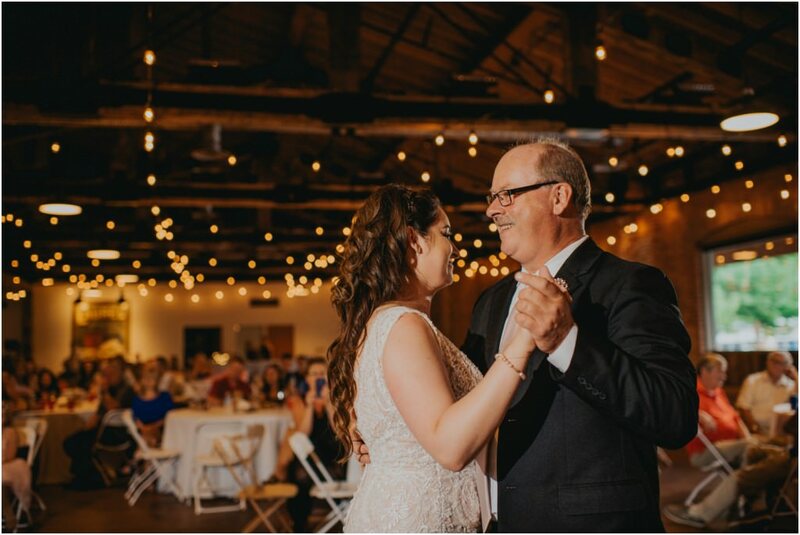 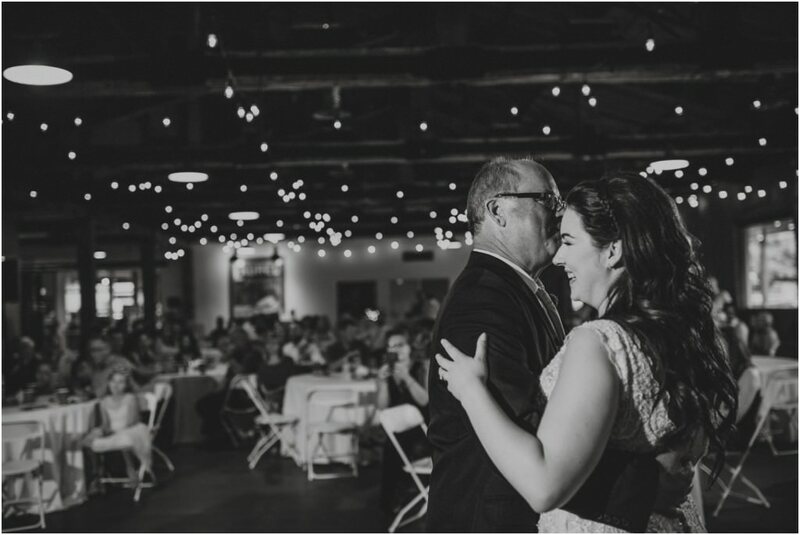 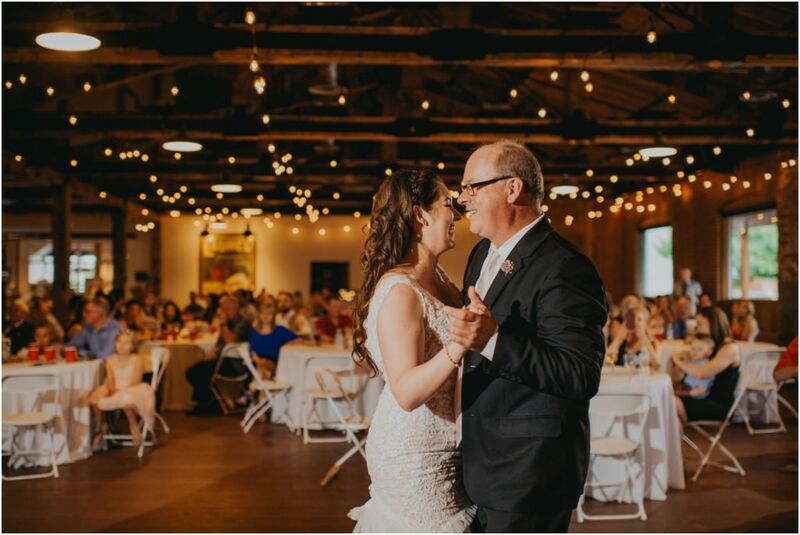 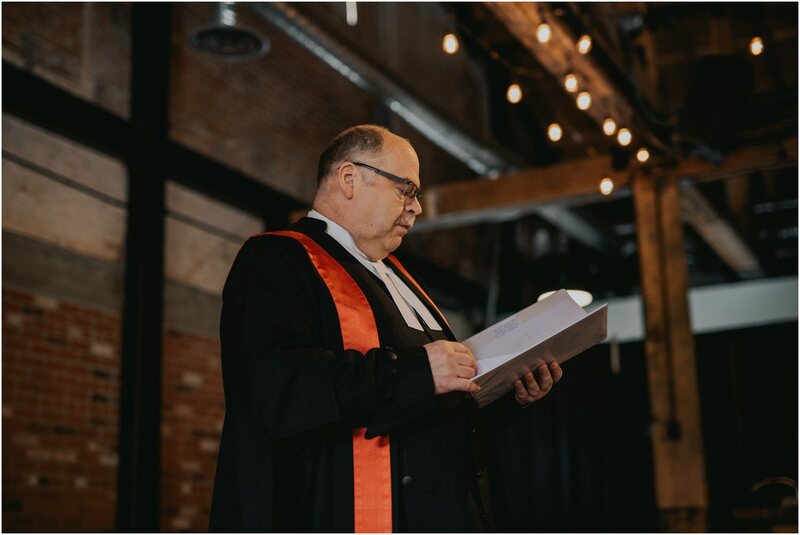 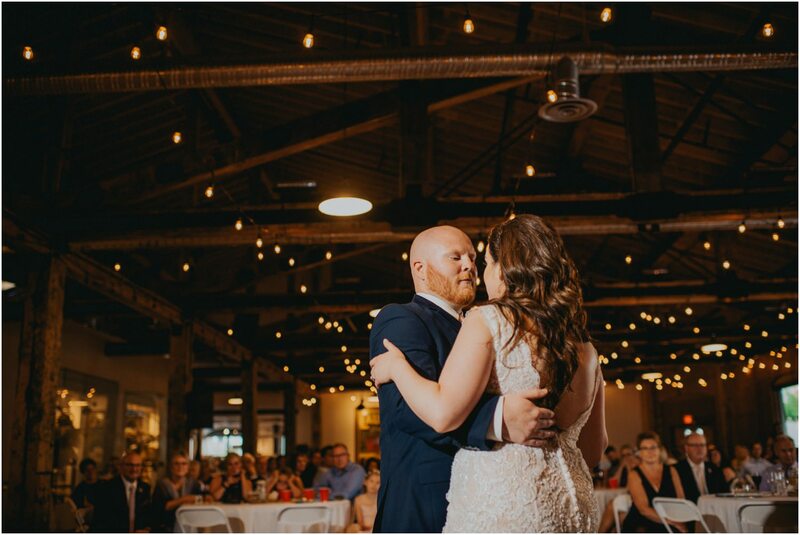 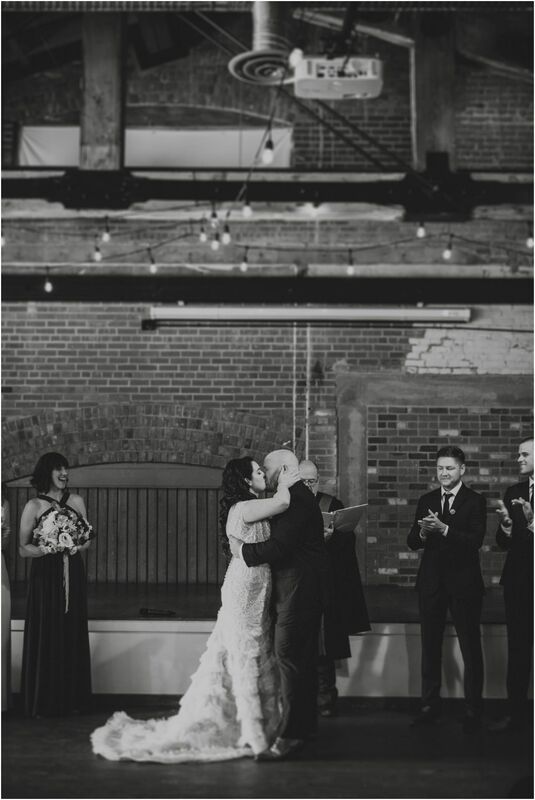 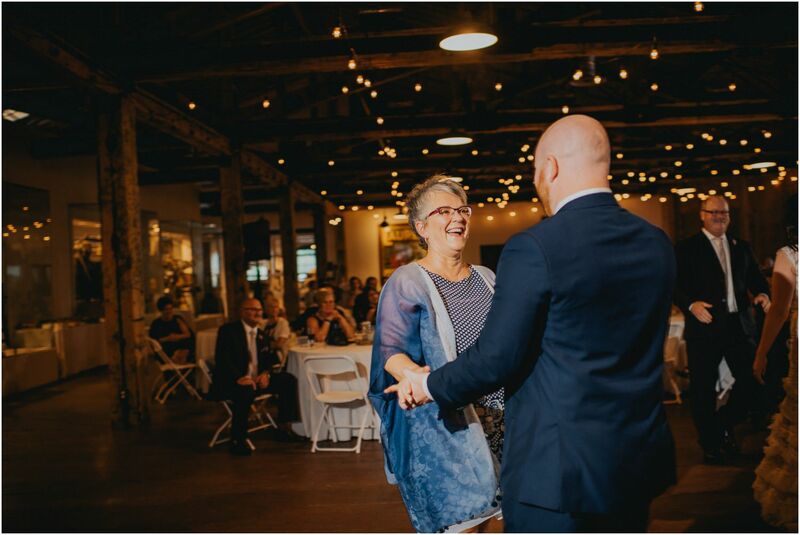 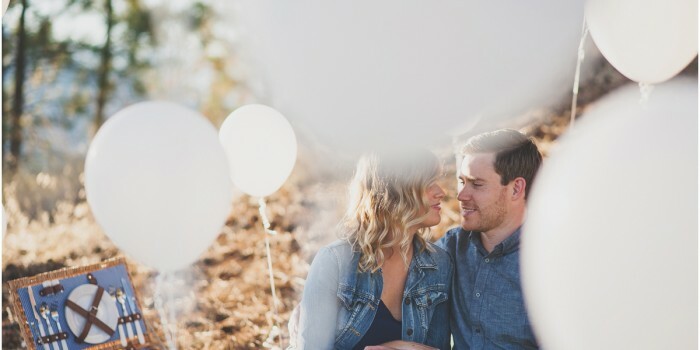 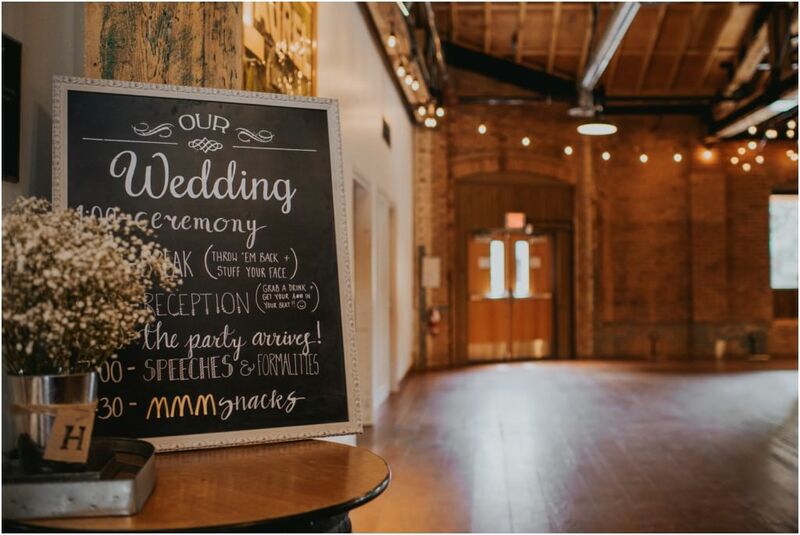 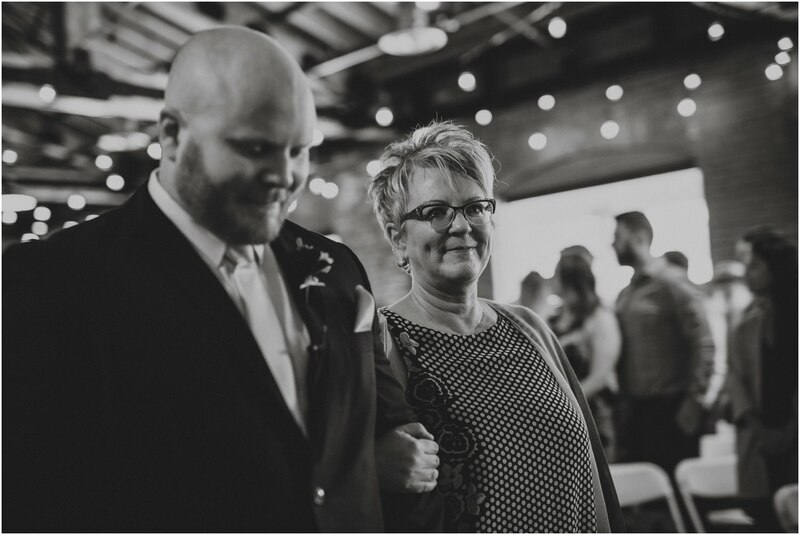 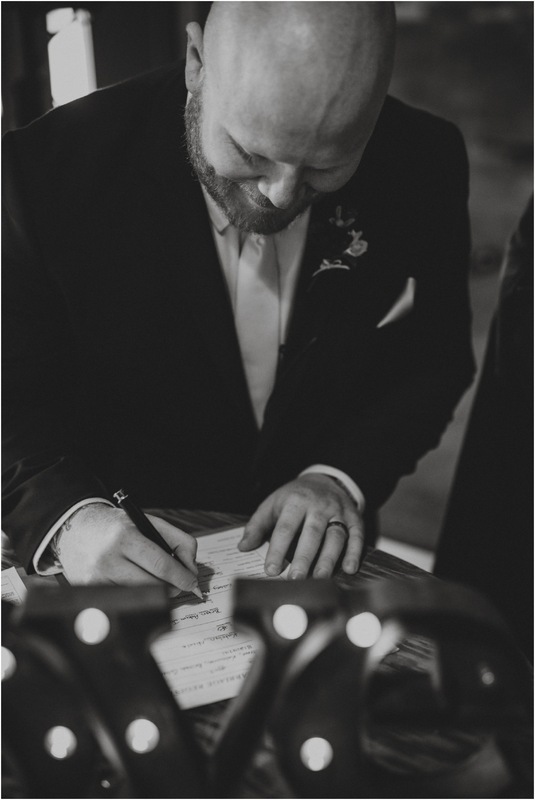 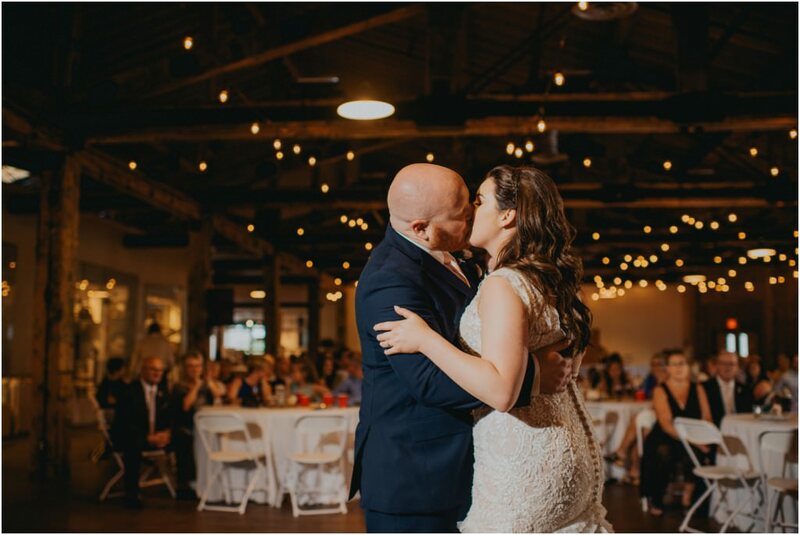 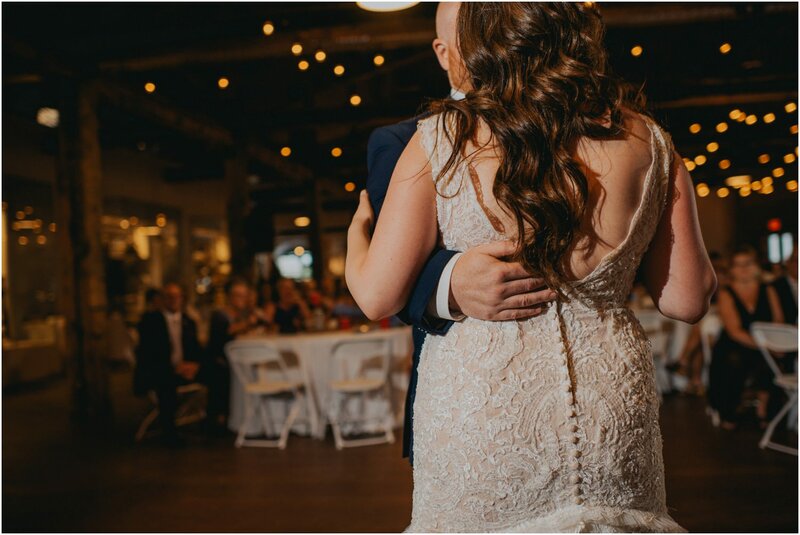 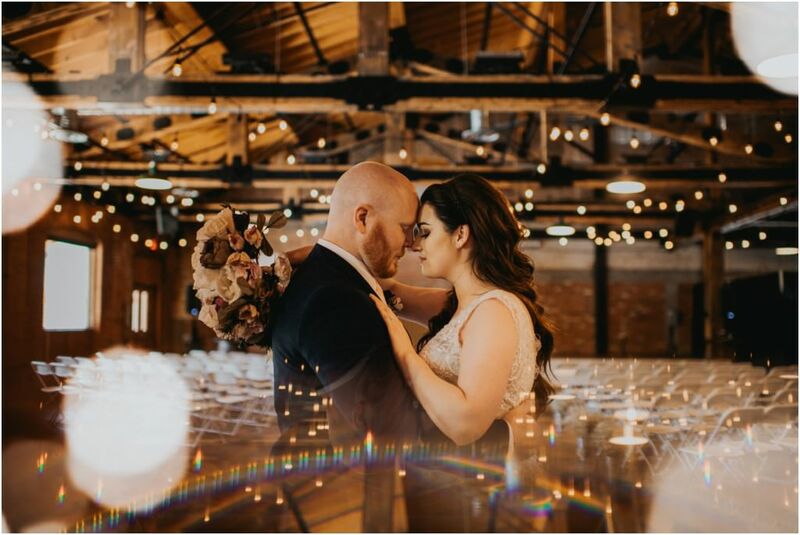 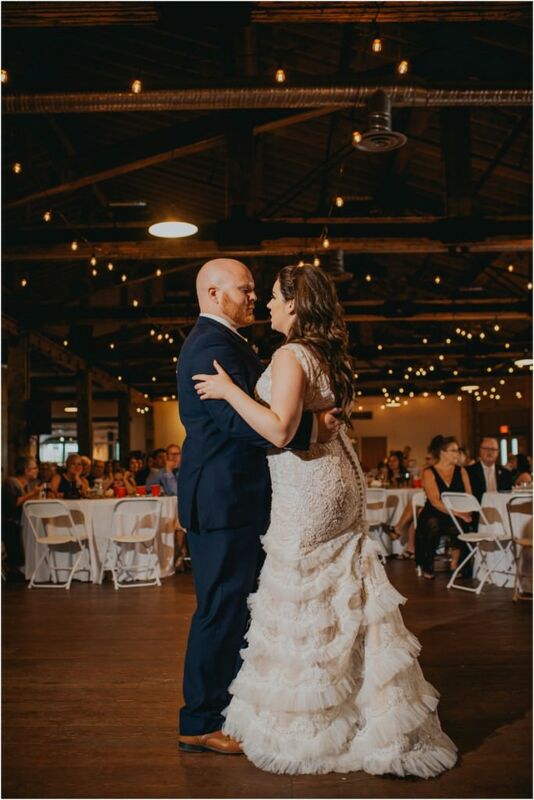 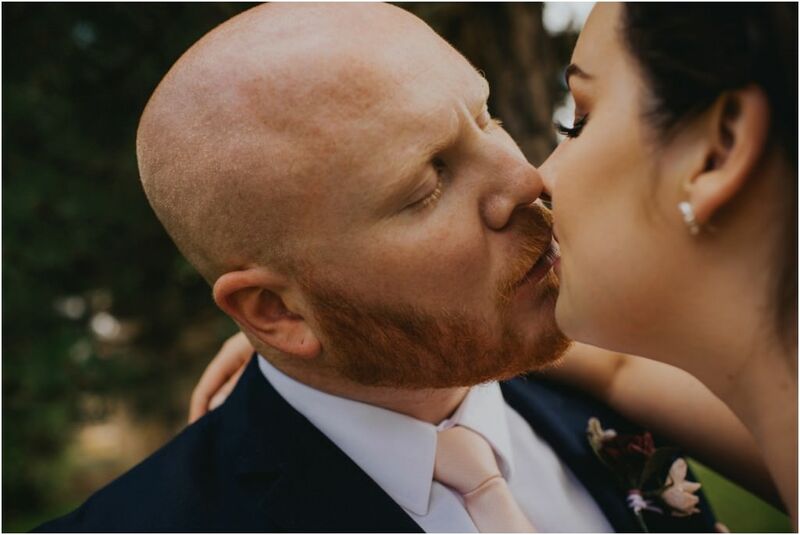 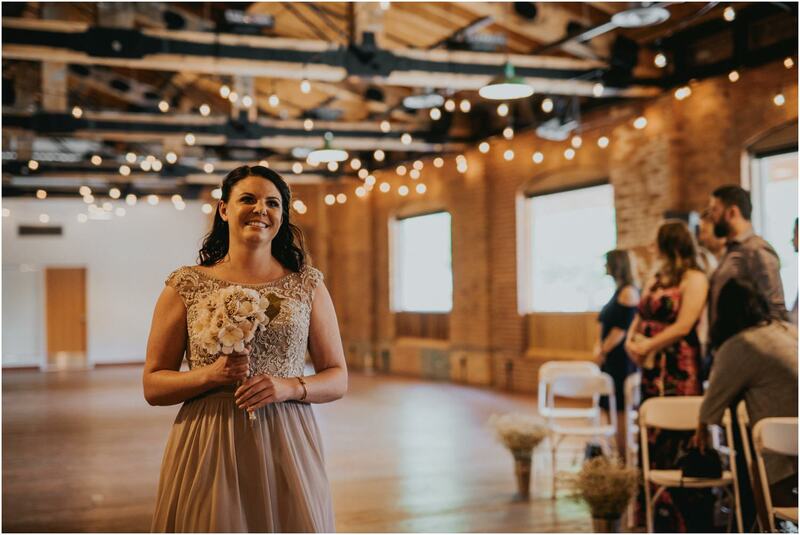 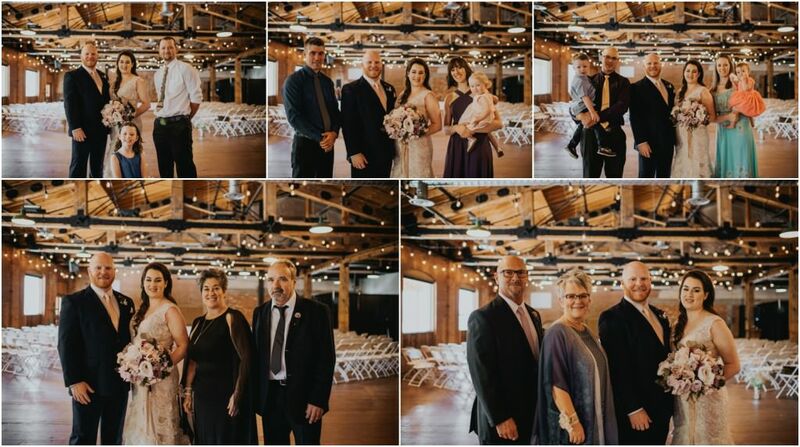 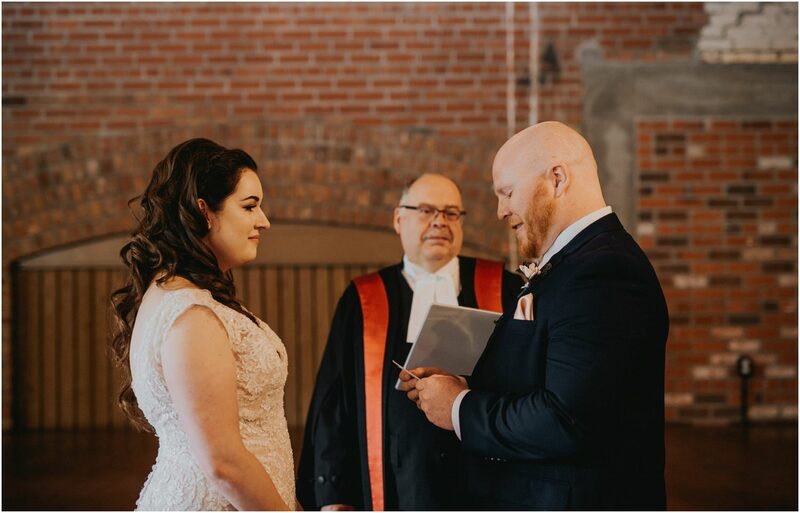 Katie and Brian had such an adventurous Laurel Packing House wedding day filled with so much love, which was only fitting for these huge hearted souls. 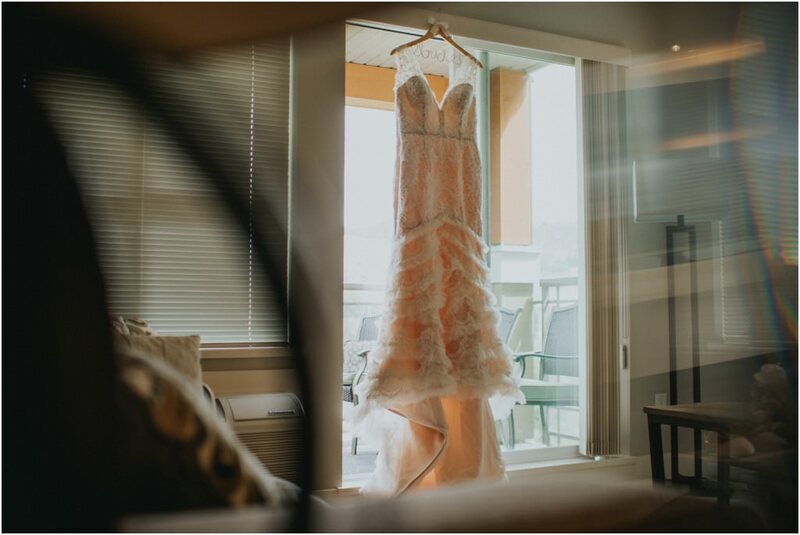 The girls started the day in their condo with excitement in the air. 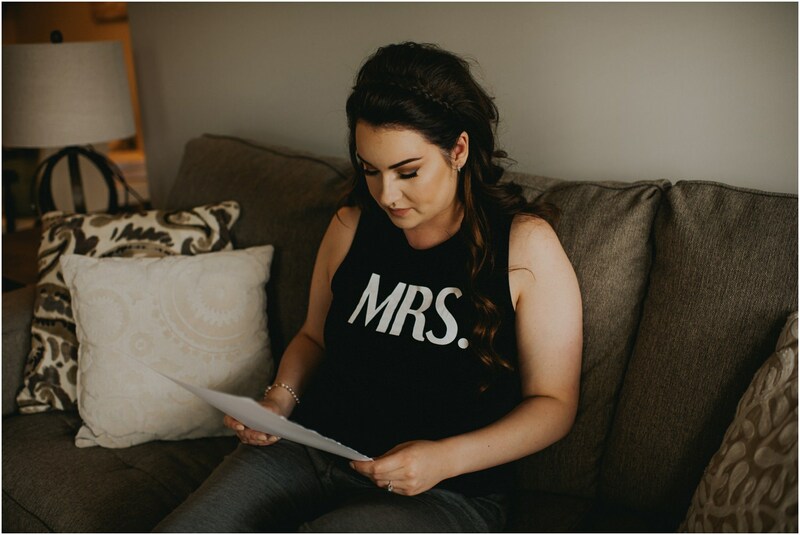 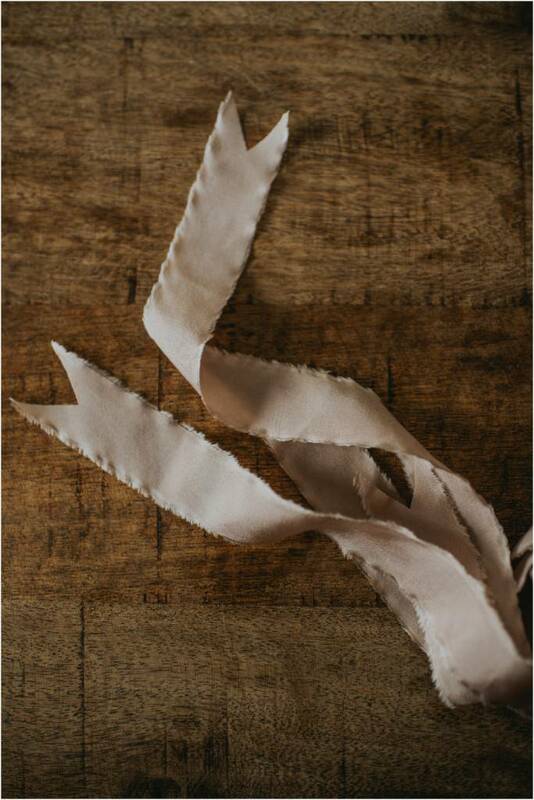 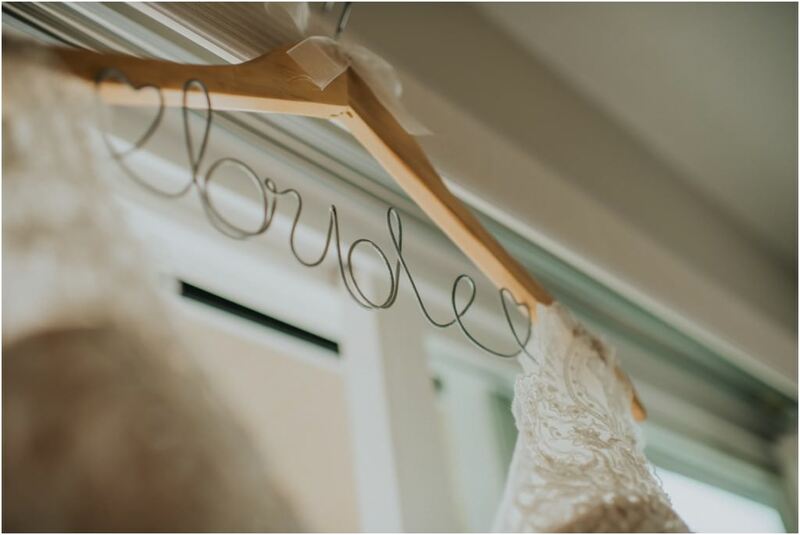 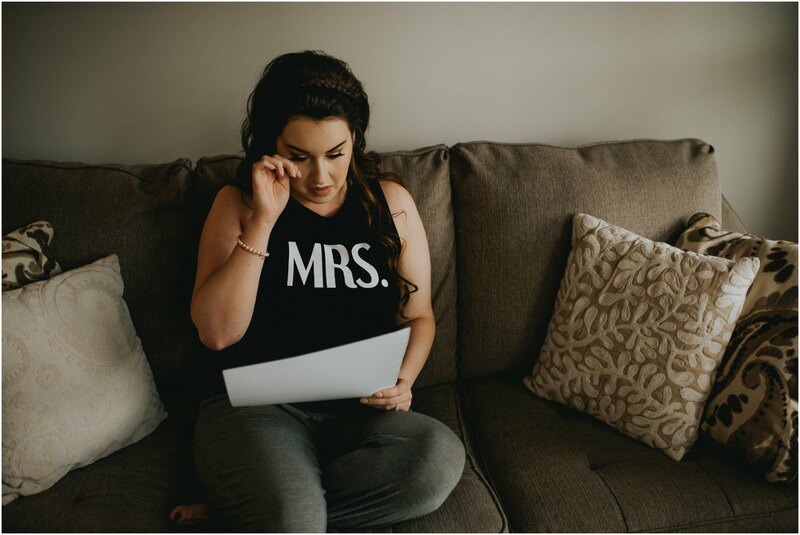 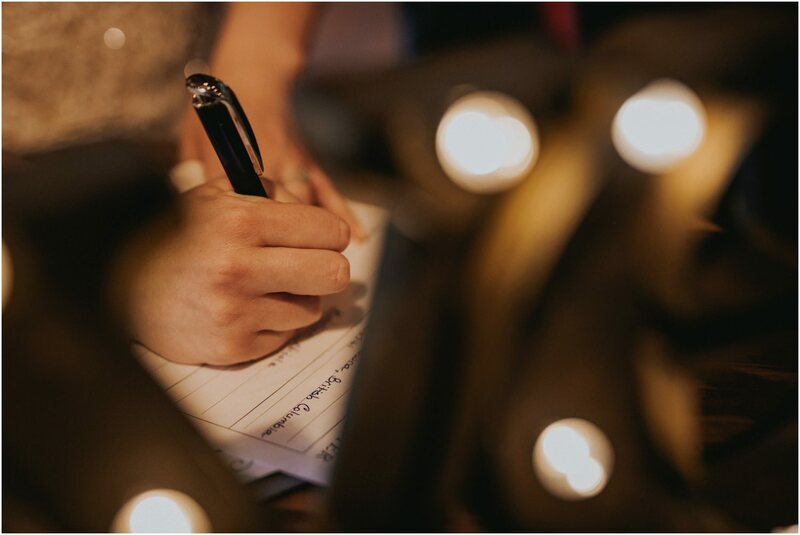 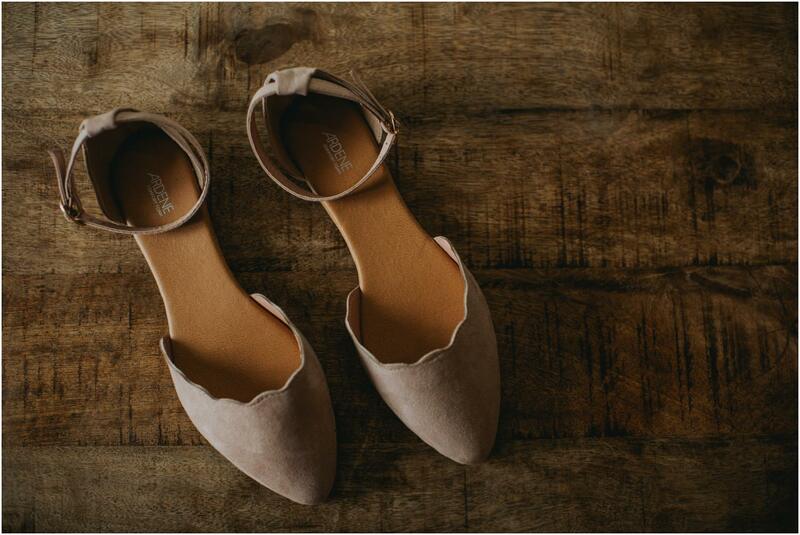 Before Katie put her wedding dress on, her bridesmaid gave her a written letter that Brian sneakily left in the bedroom. 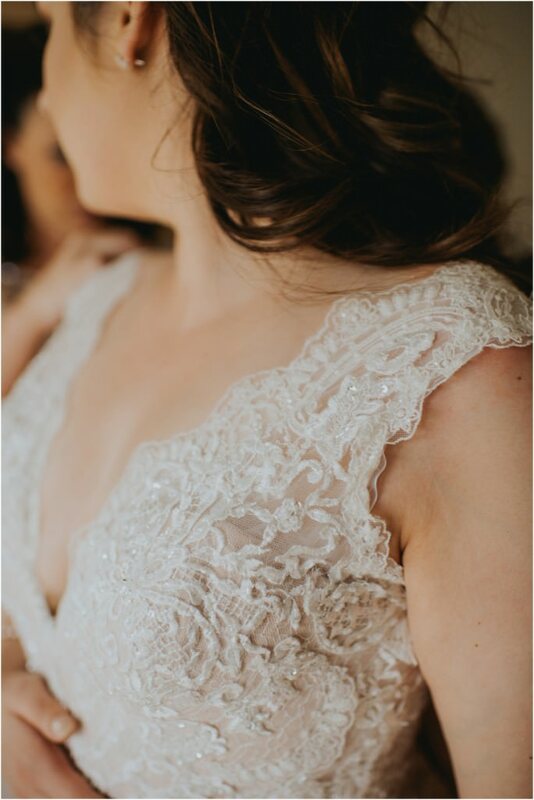 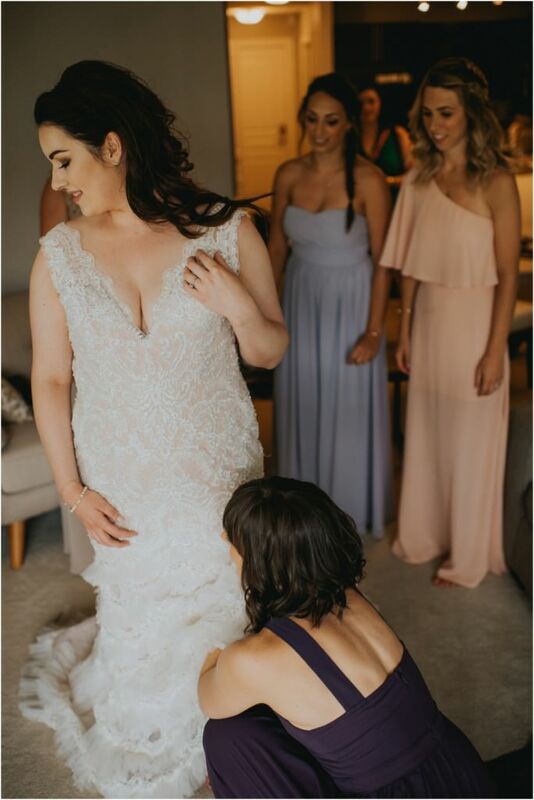 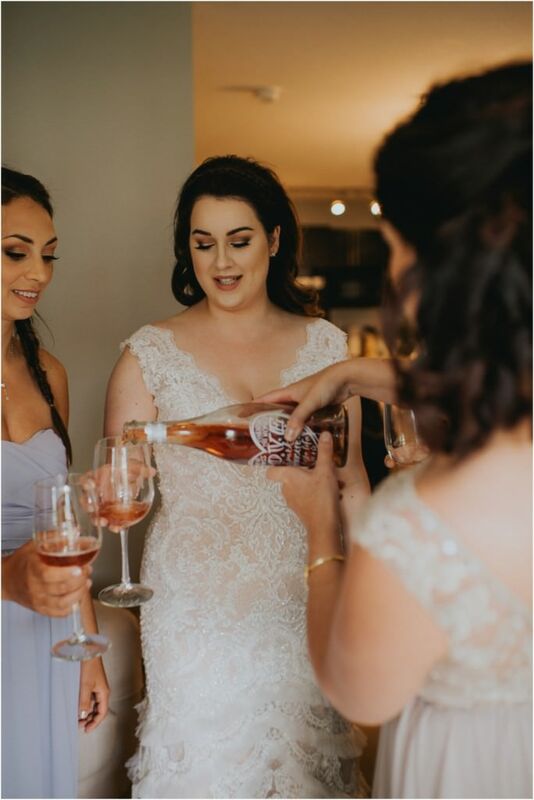 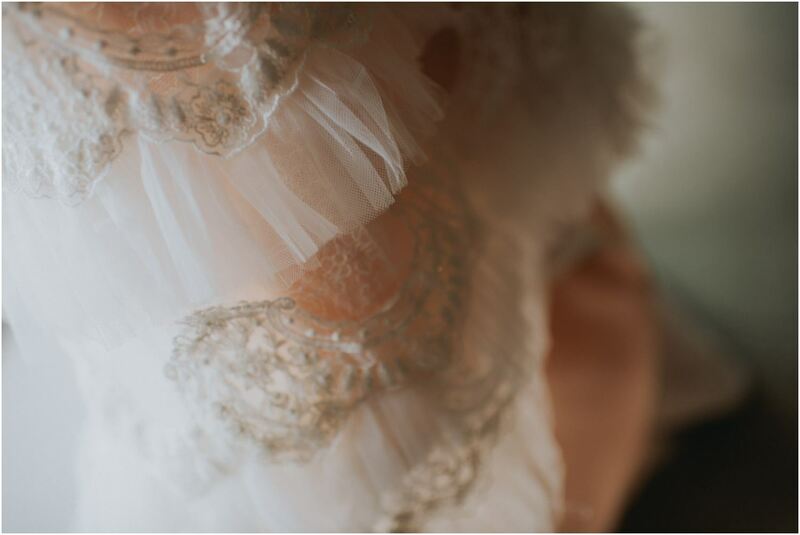 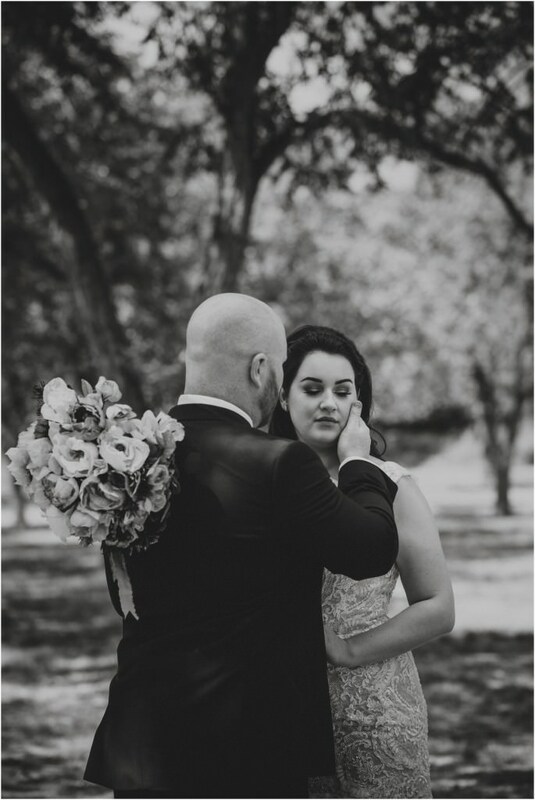 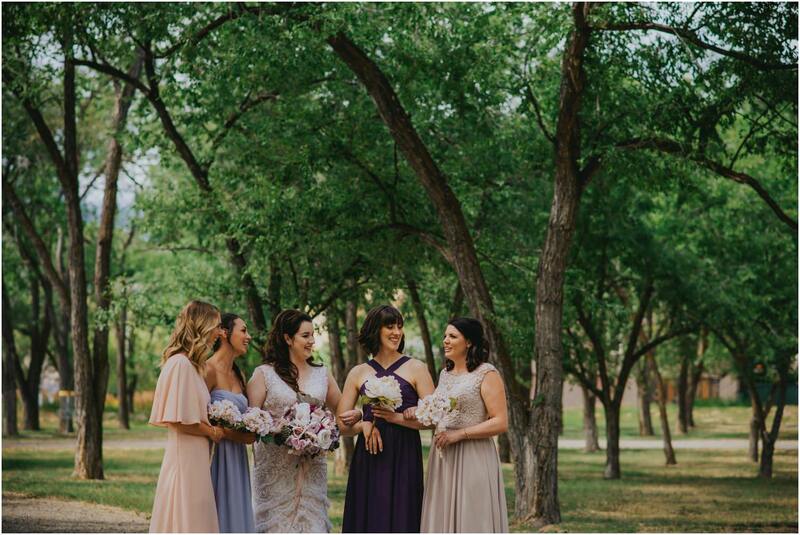 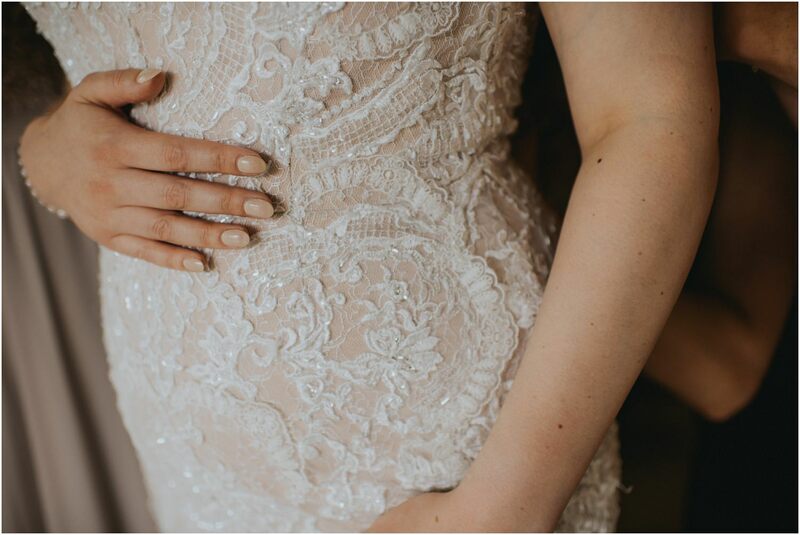 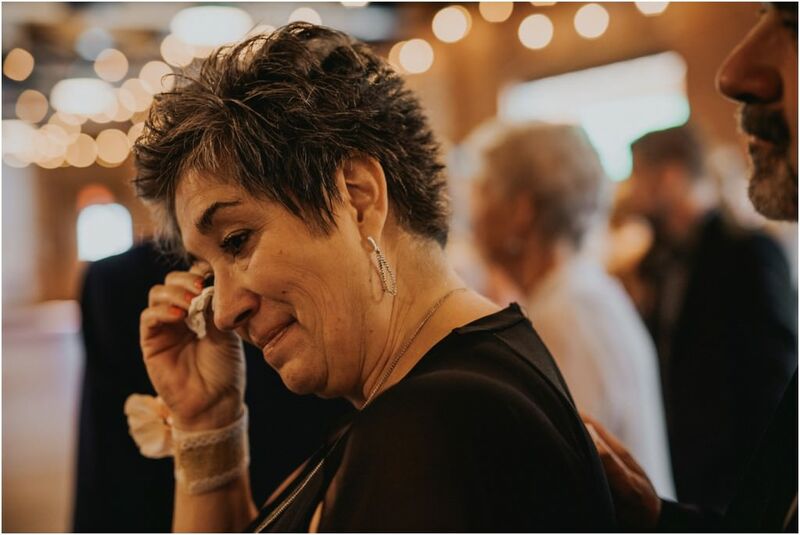 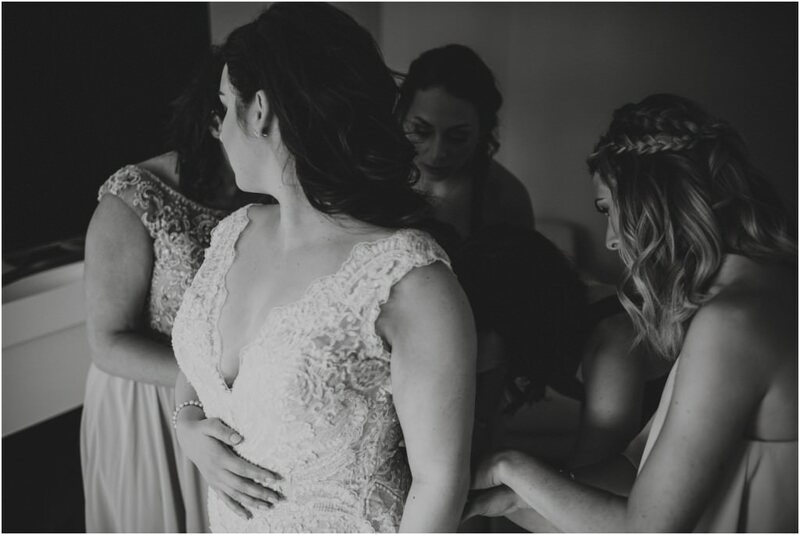 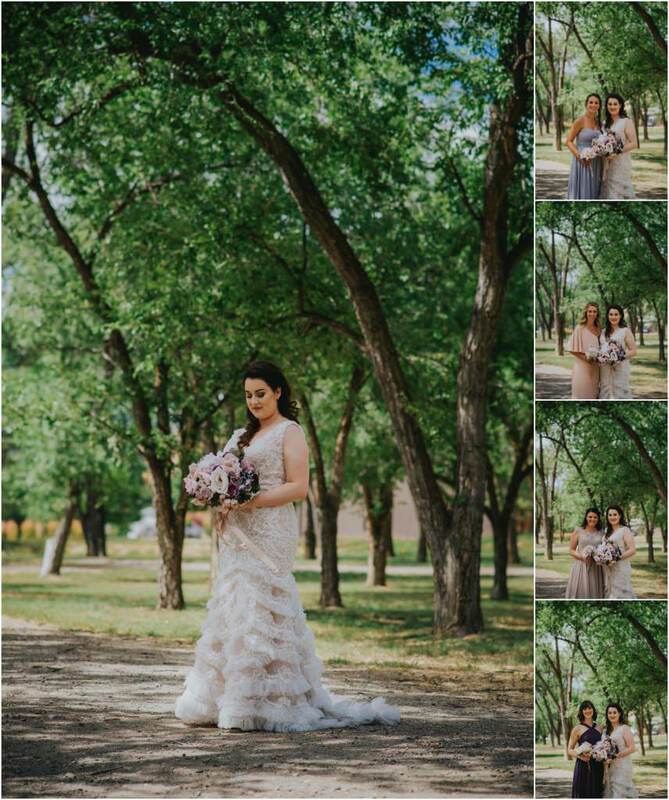 After holding back tears to not ruin her make up, her girls helped her into the wedding dress and things were about to get real as we all made our way to the ceremony! 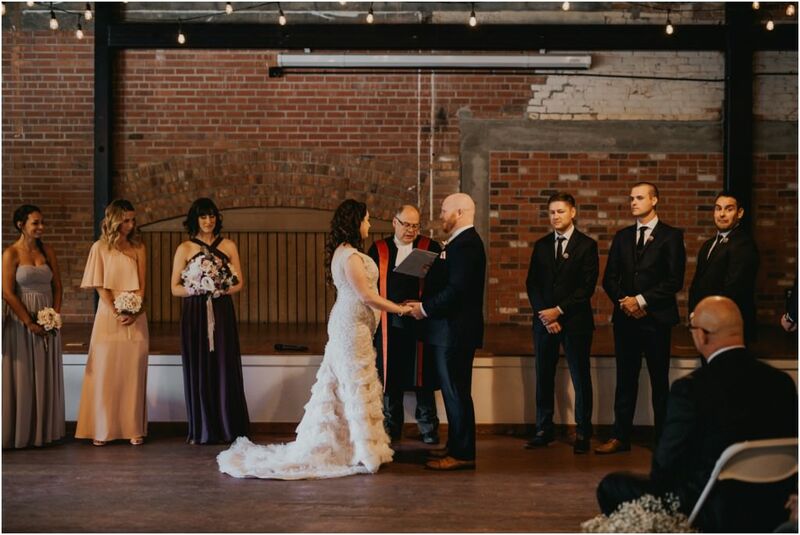 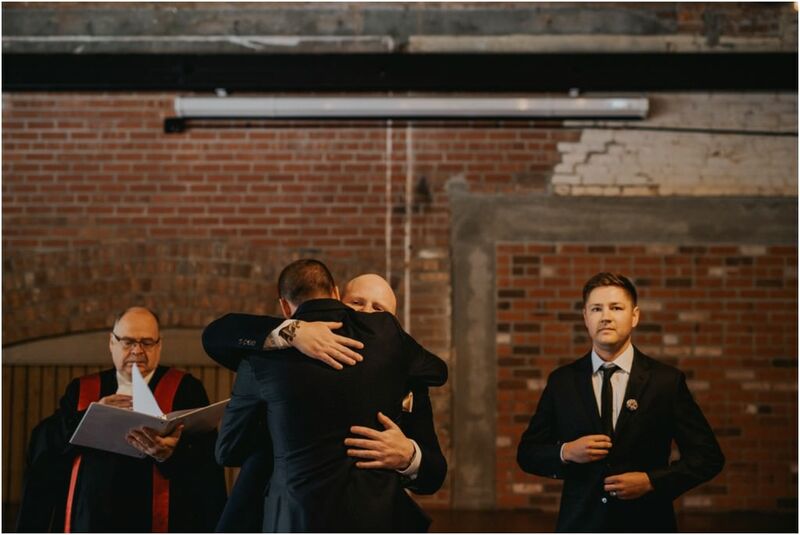 I’m such a sucker for this ceremony location as it has all of the feels. 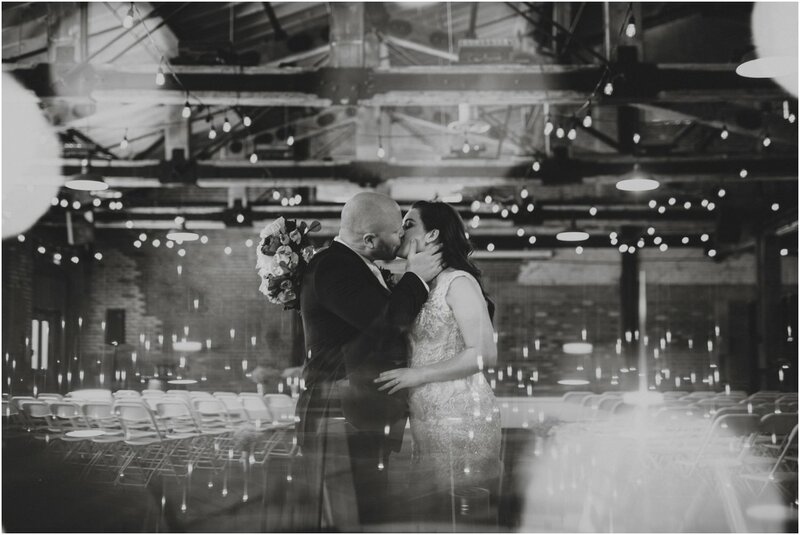 Its darker, moodier, and laced with string lights. 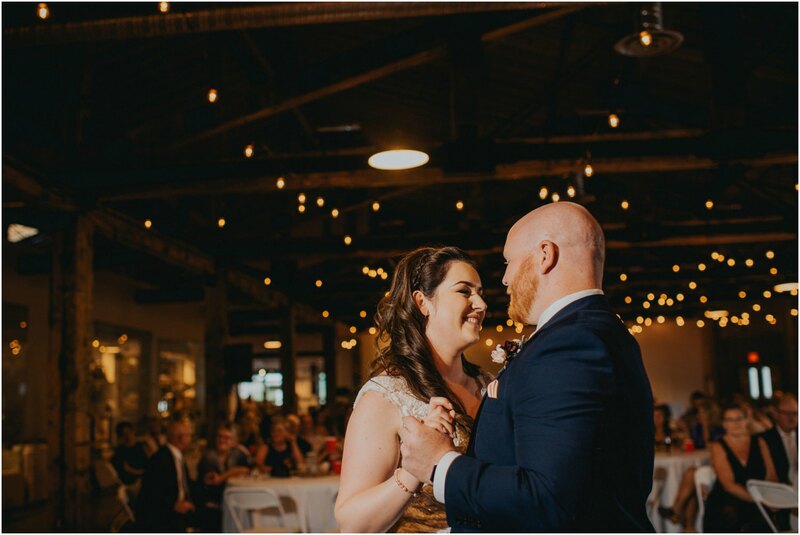 The most perfect place for these two as they said I do surrounded by their friends and family. 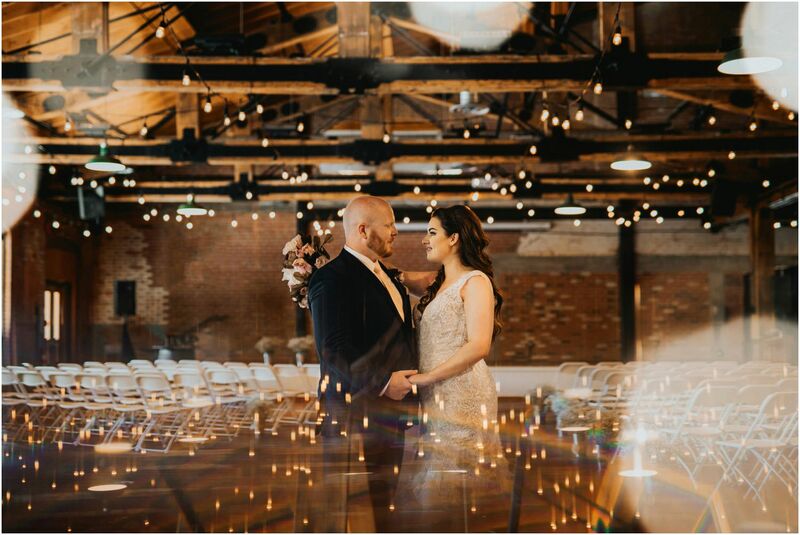 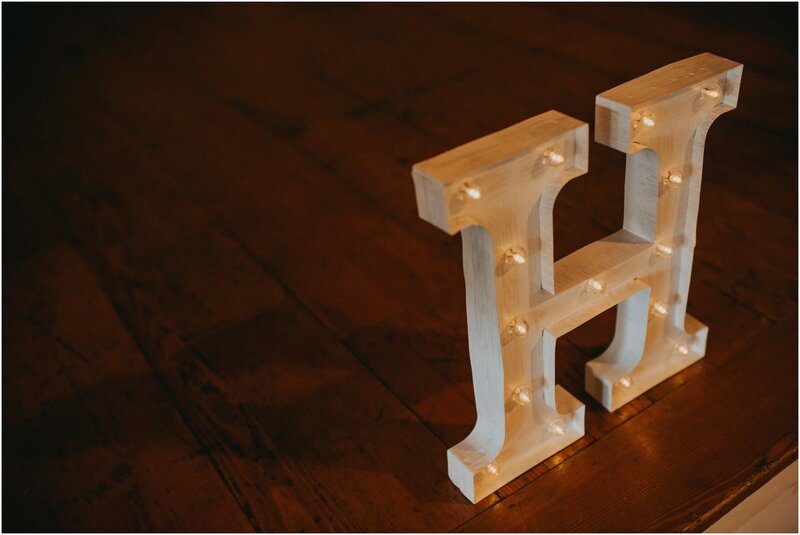 Of course before we left to our locations, I had to capture a couple frames of these two engulfed in the lights! 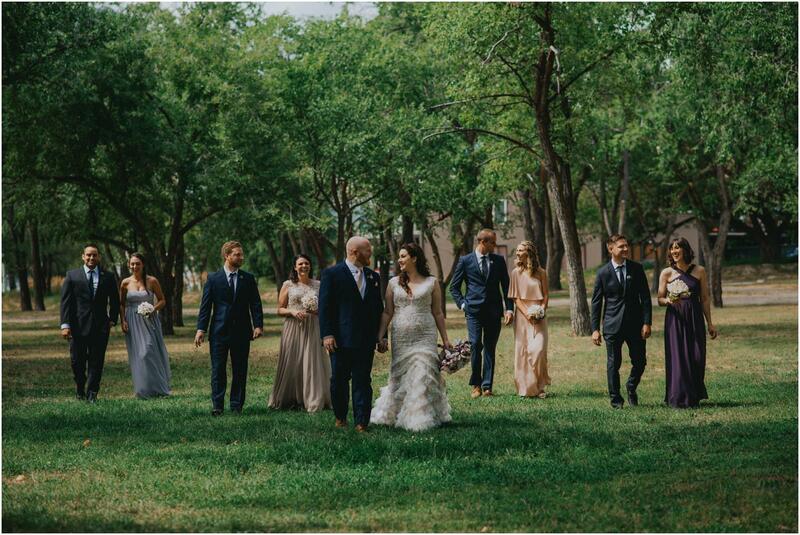 From here, we went to a darling tree’d area with the whole wedding party. 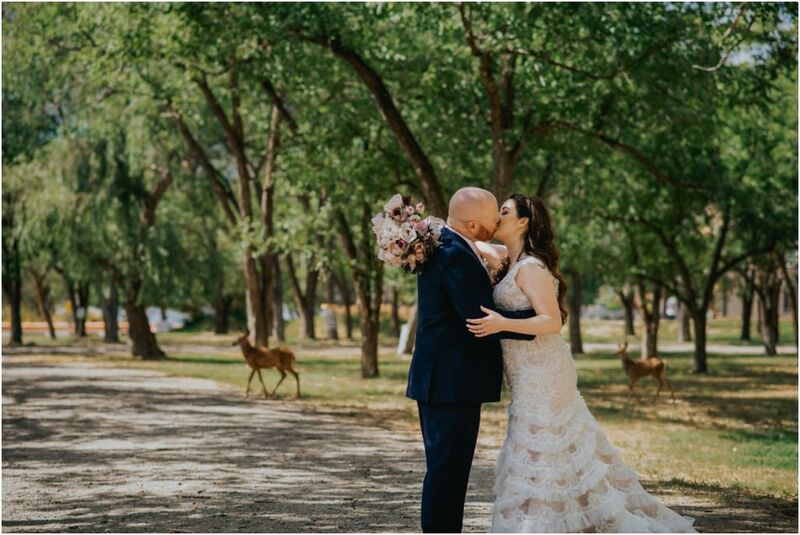 As we were leaving, we actually were photobombed by a couple curious dear! 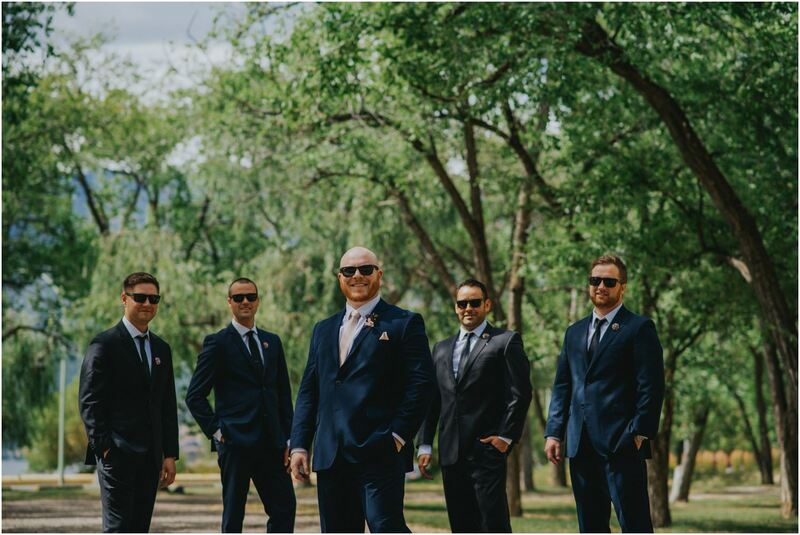 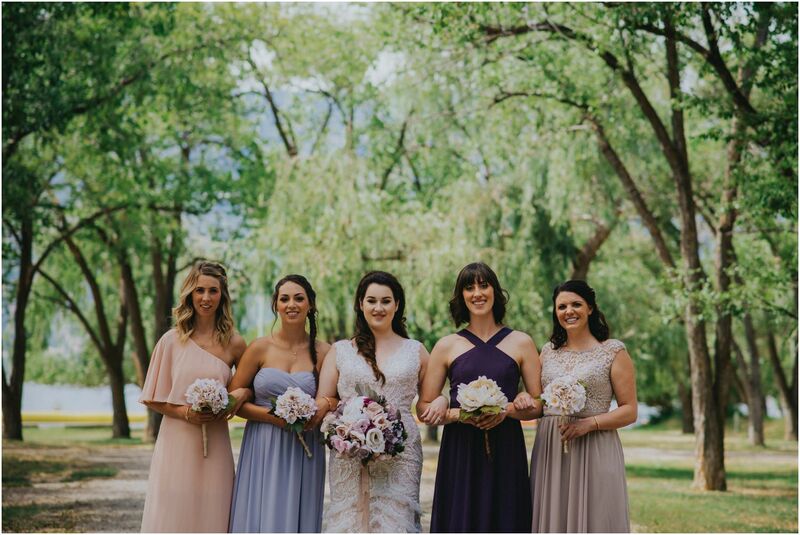 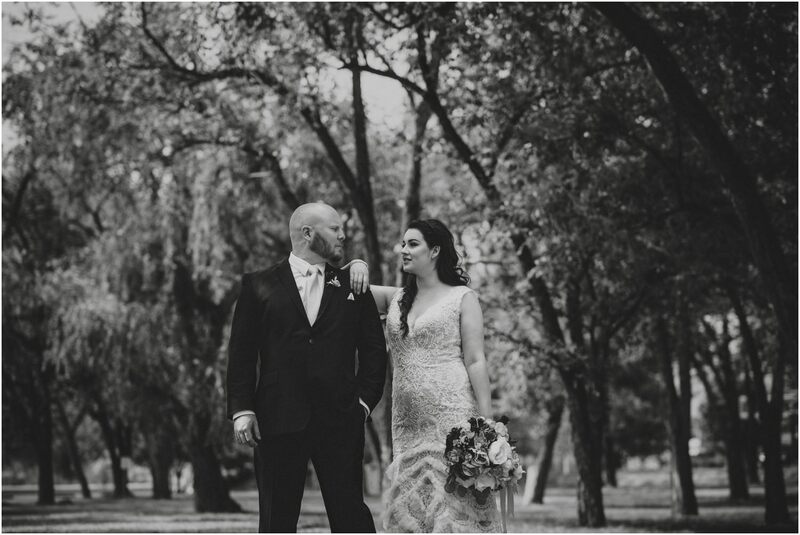 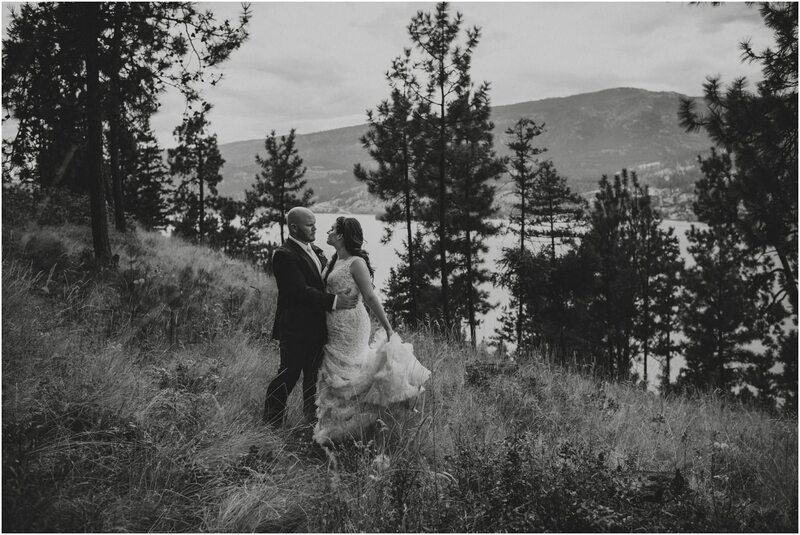 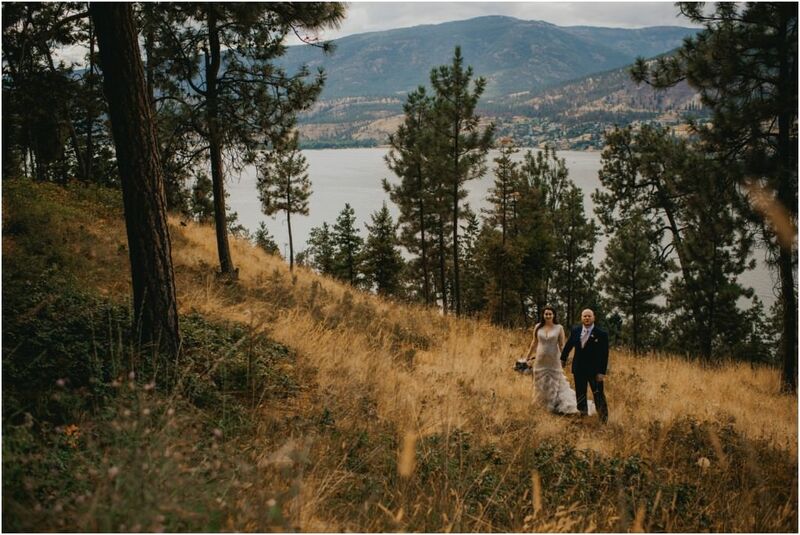 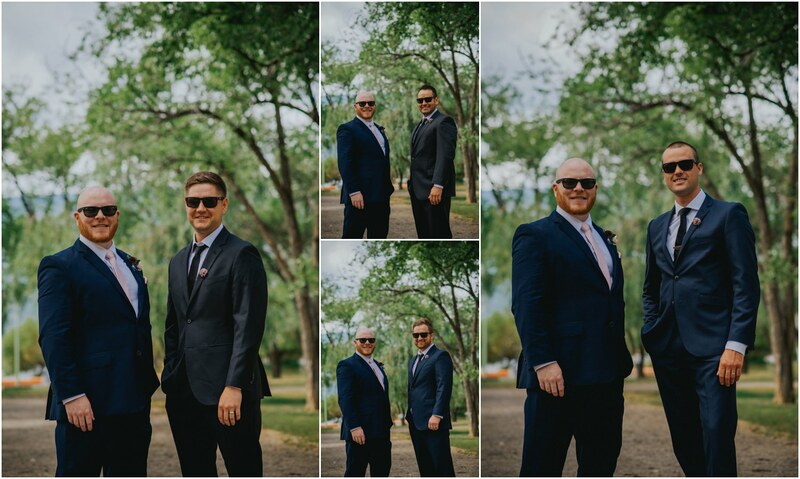 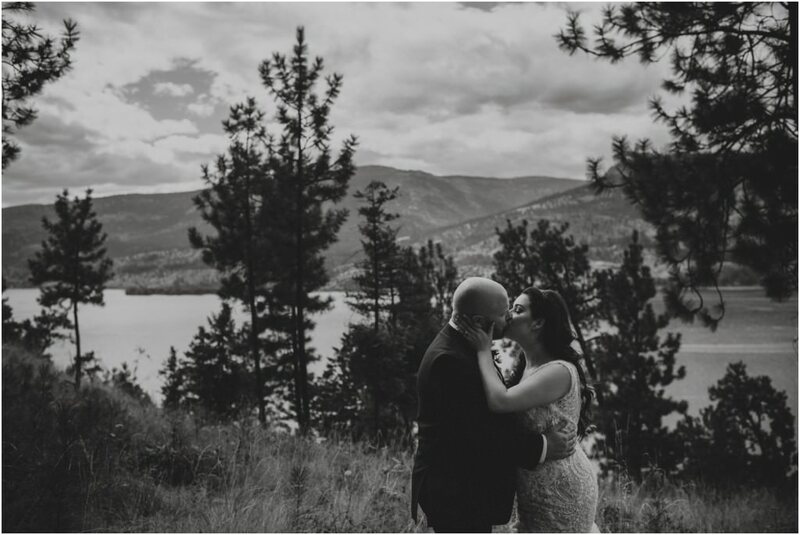 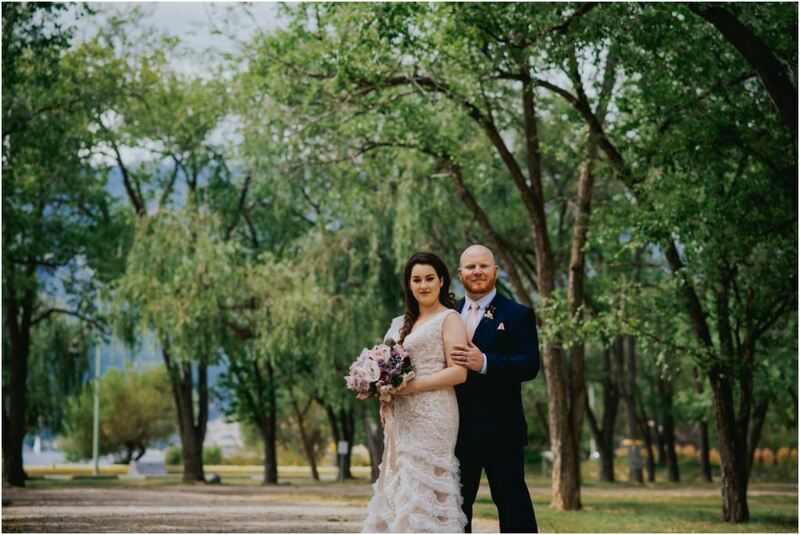 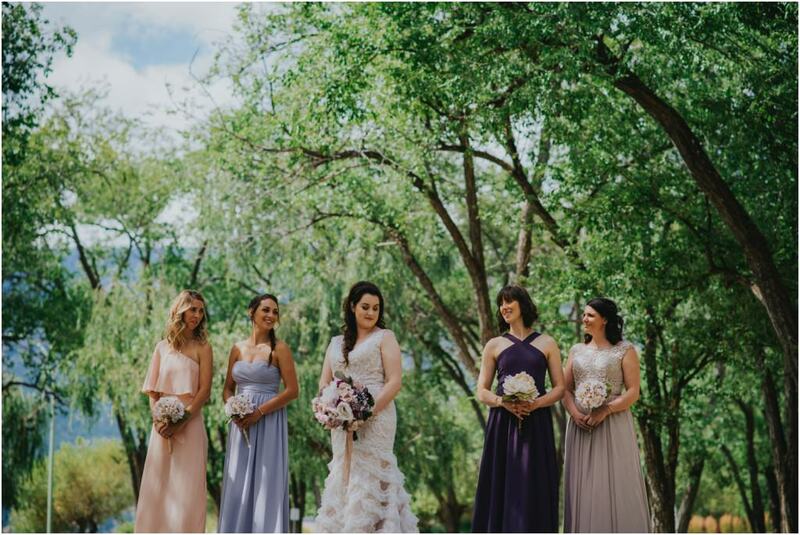 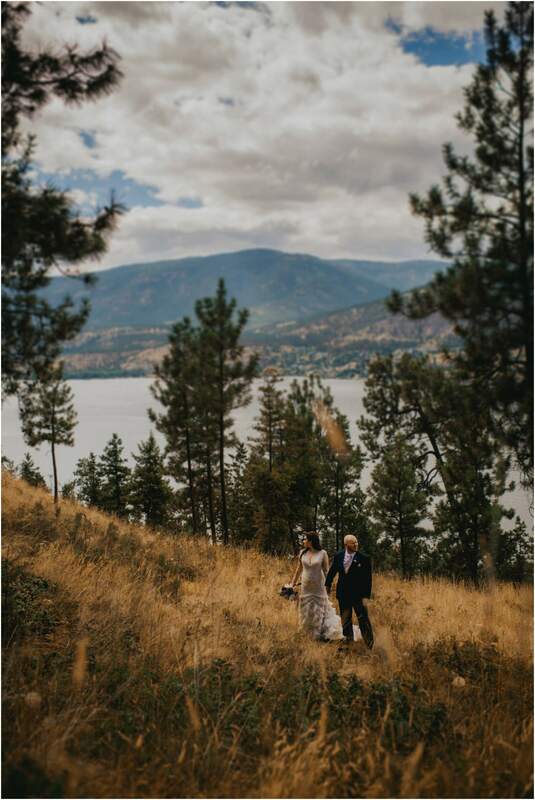 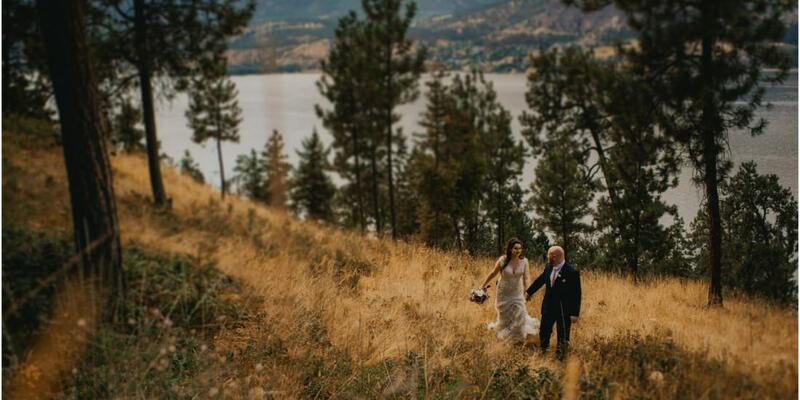 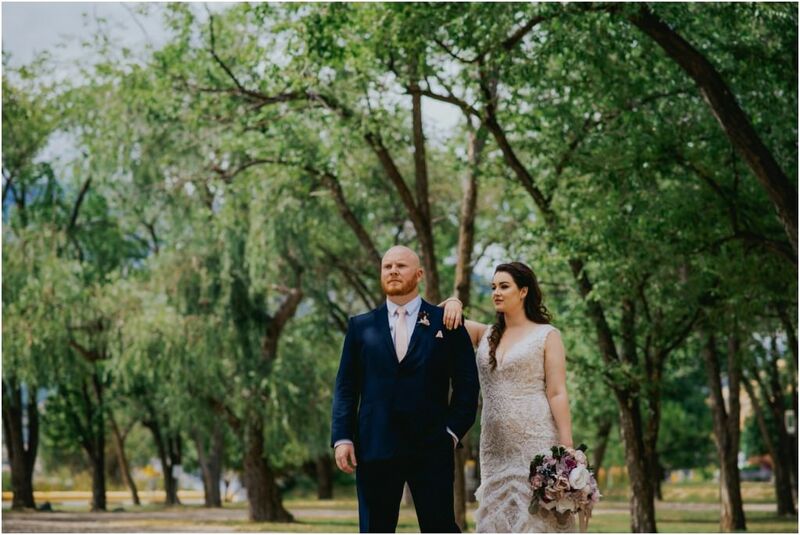 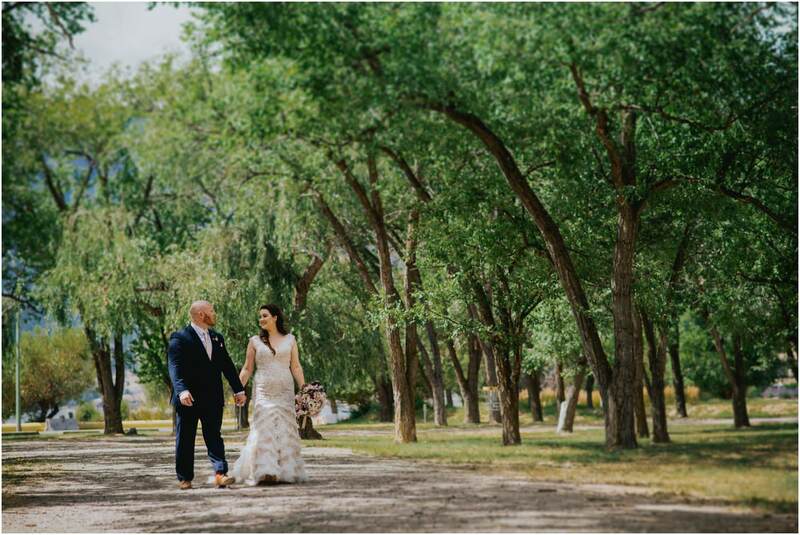 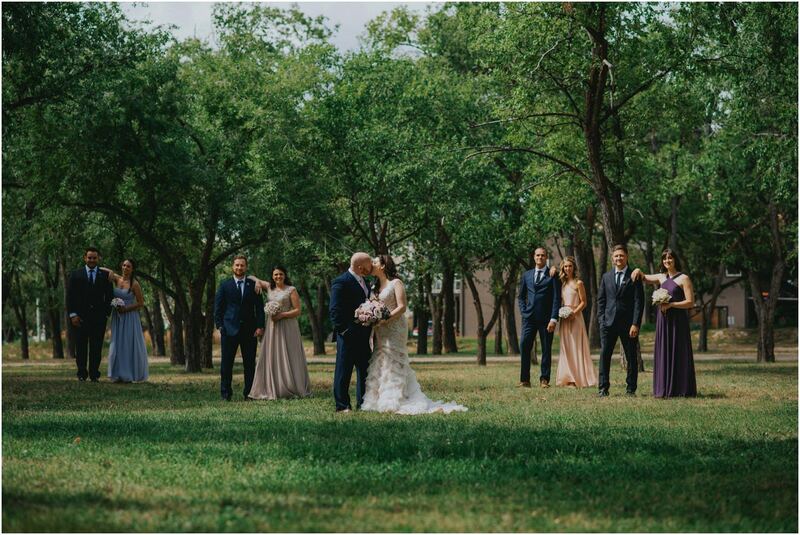 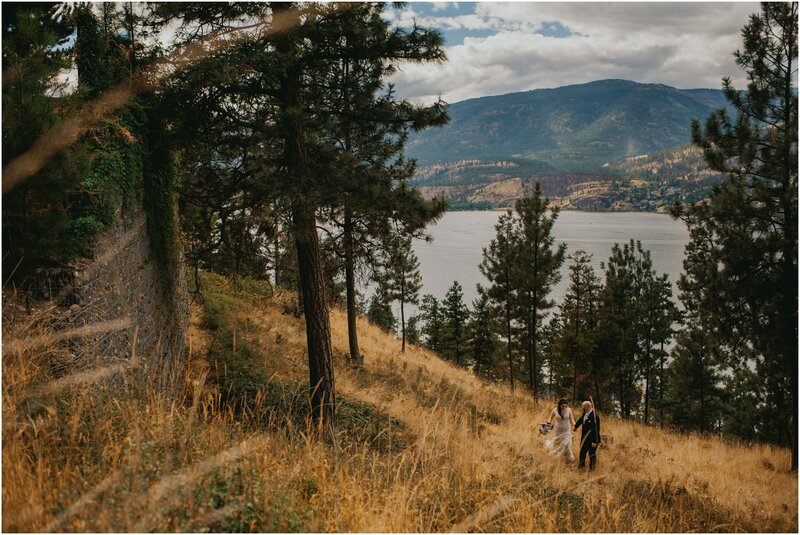 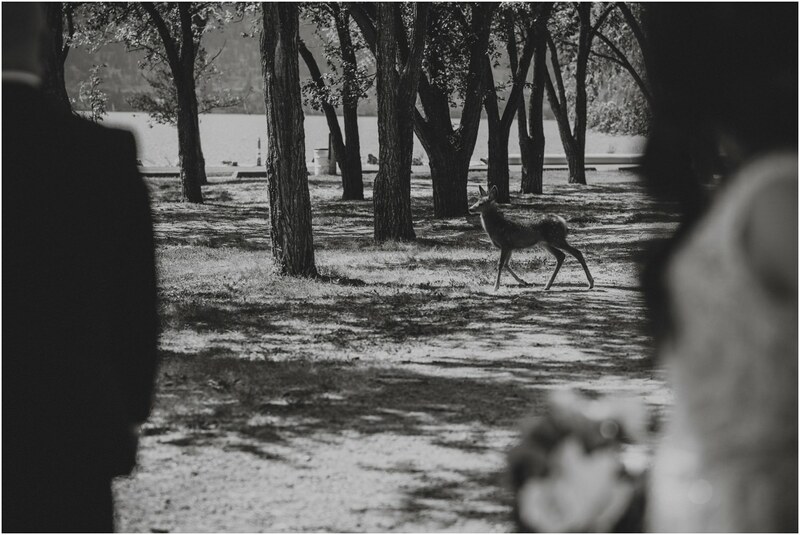 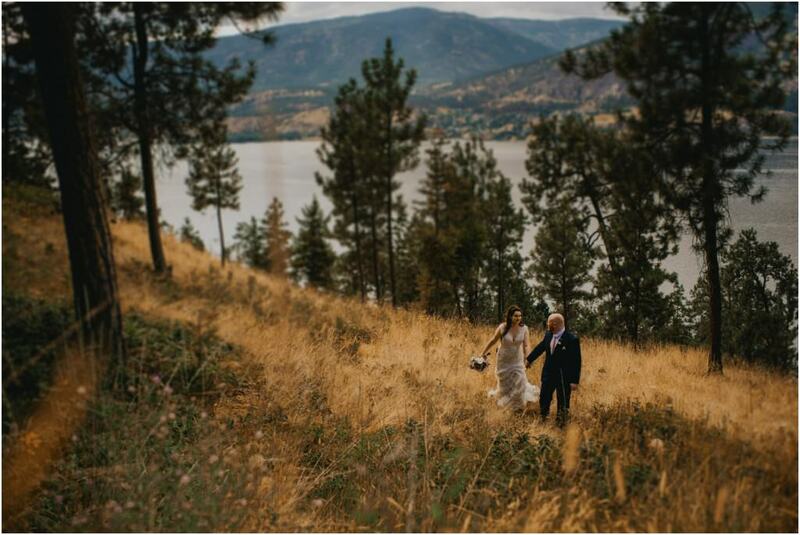 We then went to a secluded grassy bank with lake views of the Okanagan for an intimate yet adventurous time for Katie and Brian. 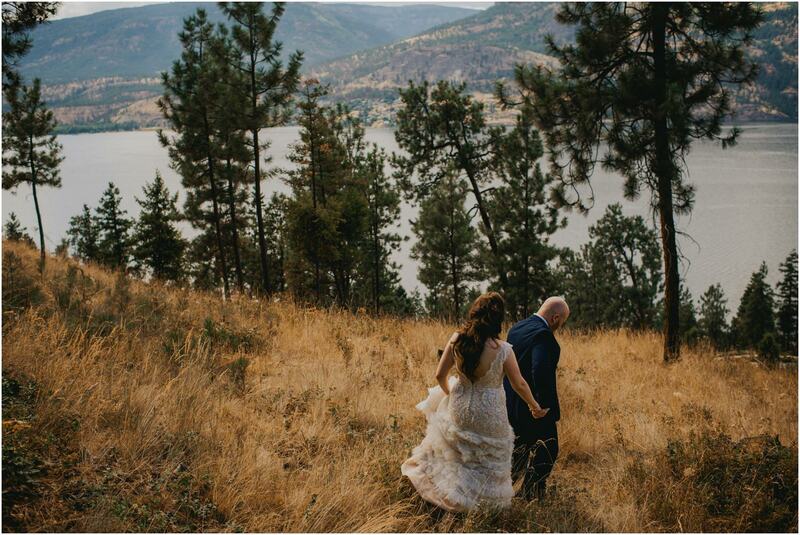 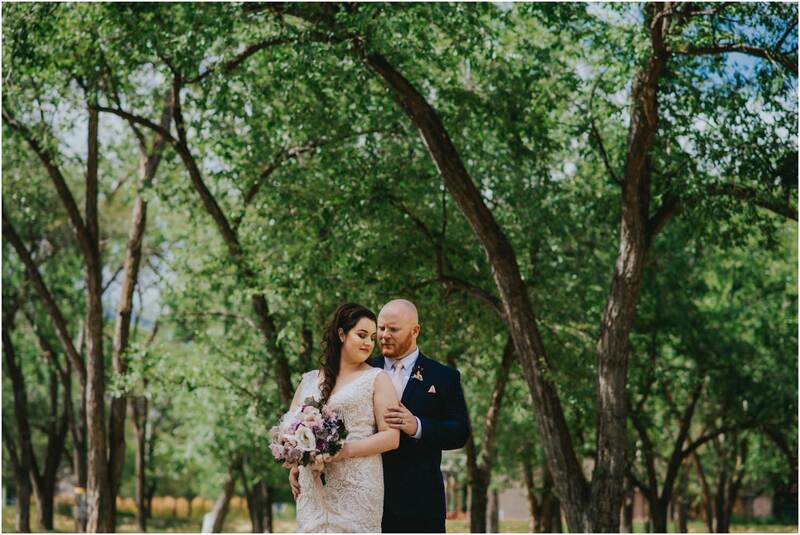 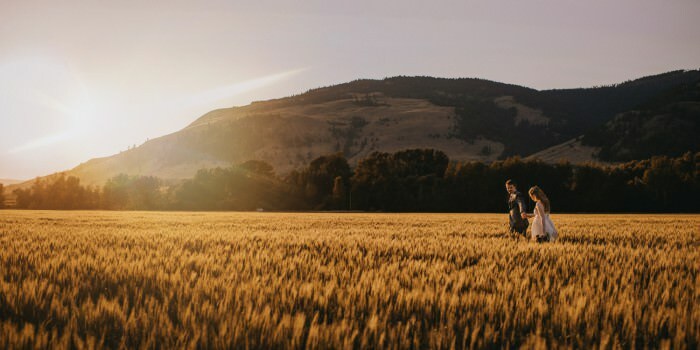 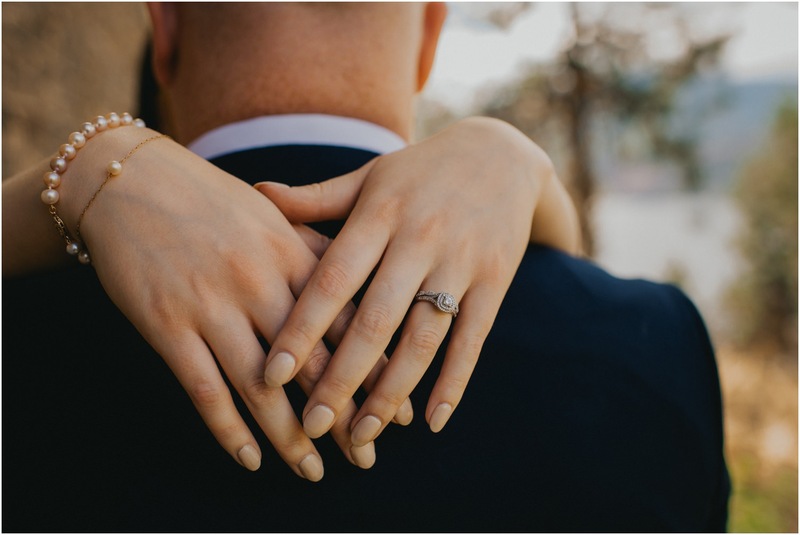 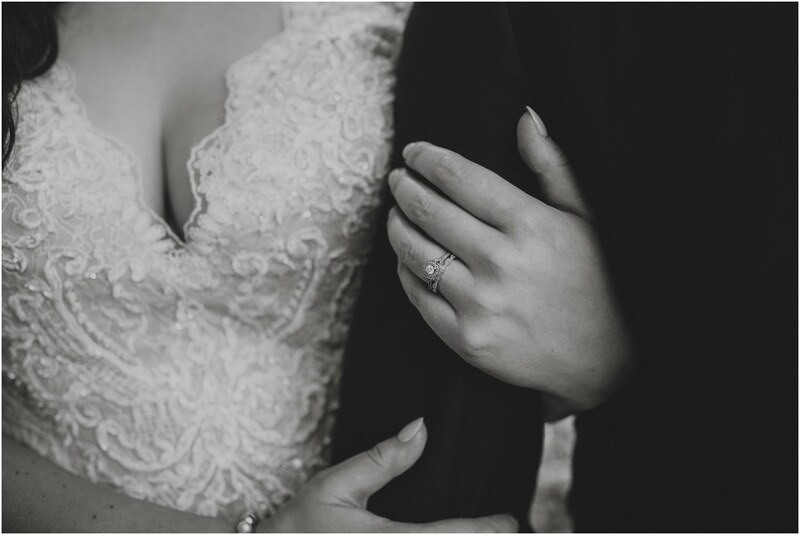 As they trekked down the hill hand in hand, you could feel the happiness in the air between them both as they took it all in as a married couple! 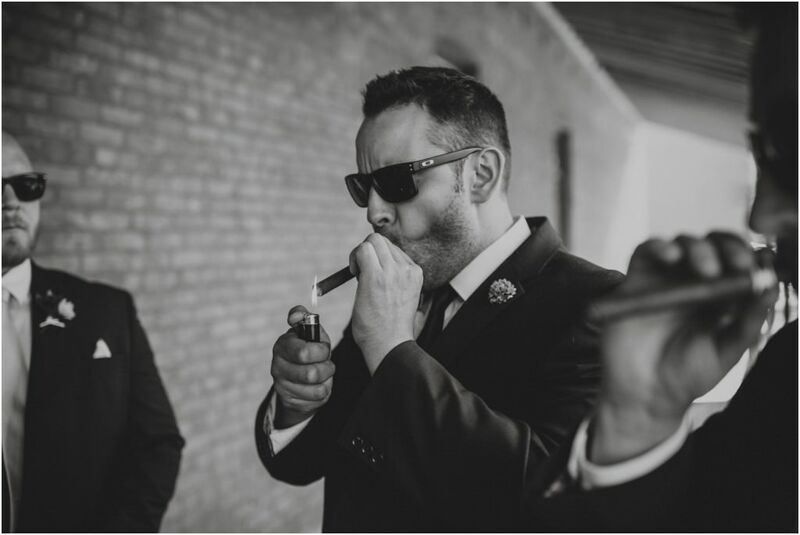 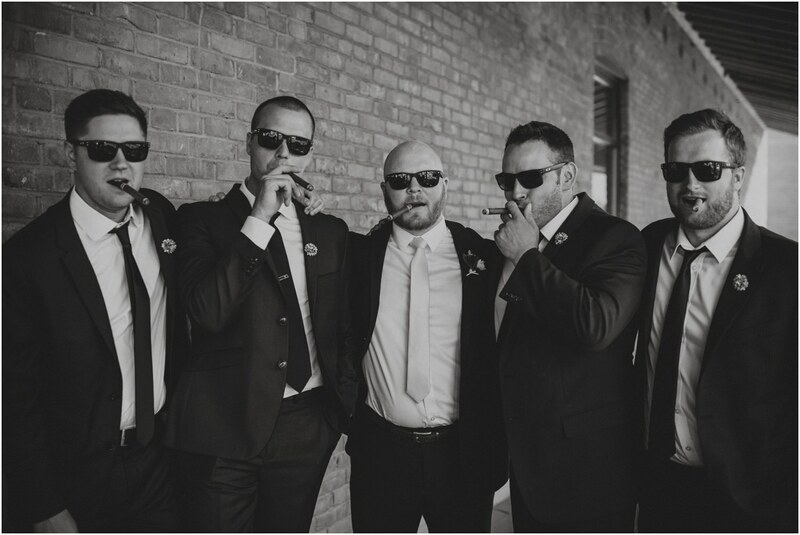 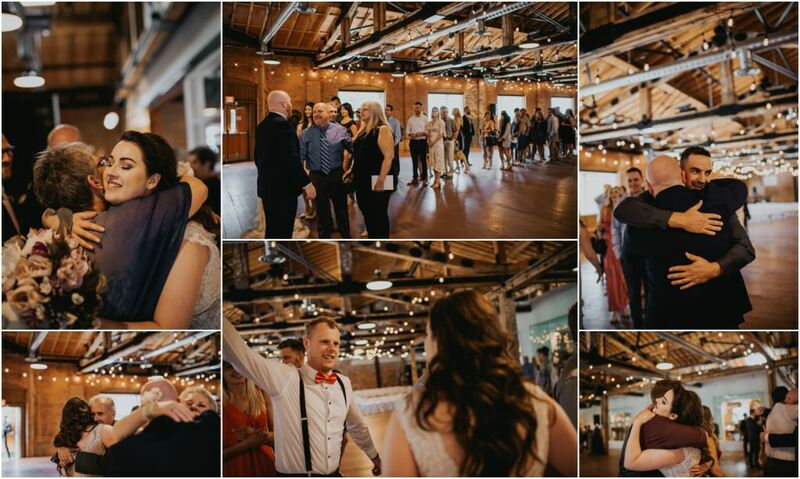 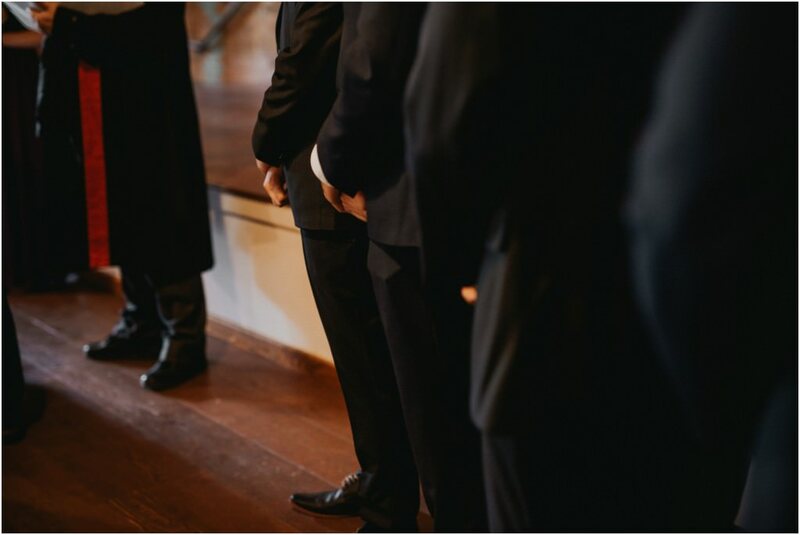 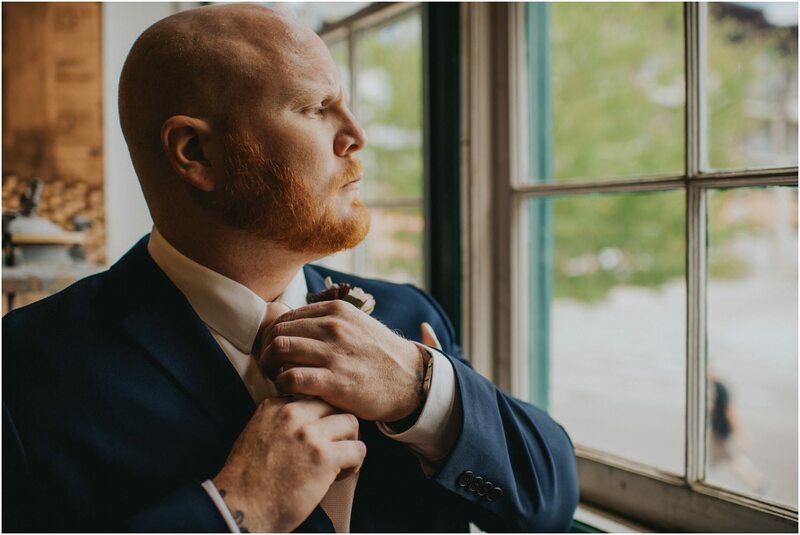 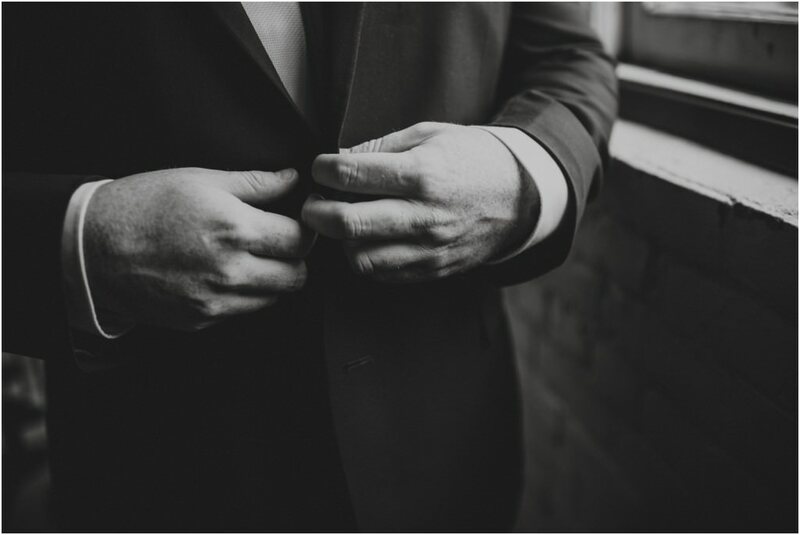 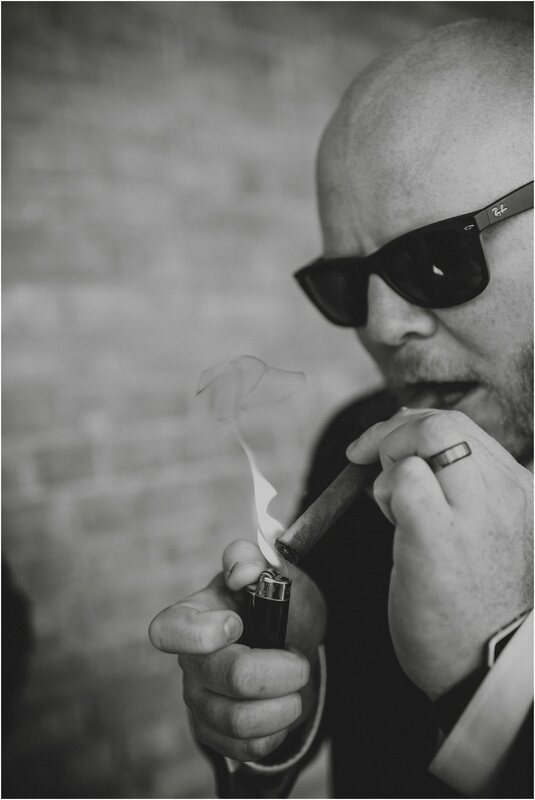 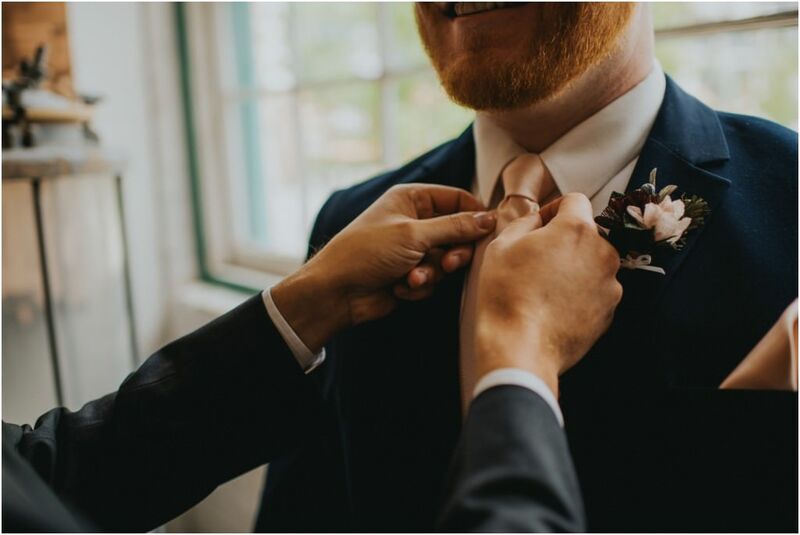 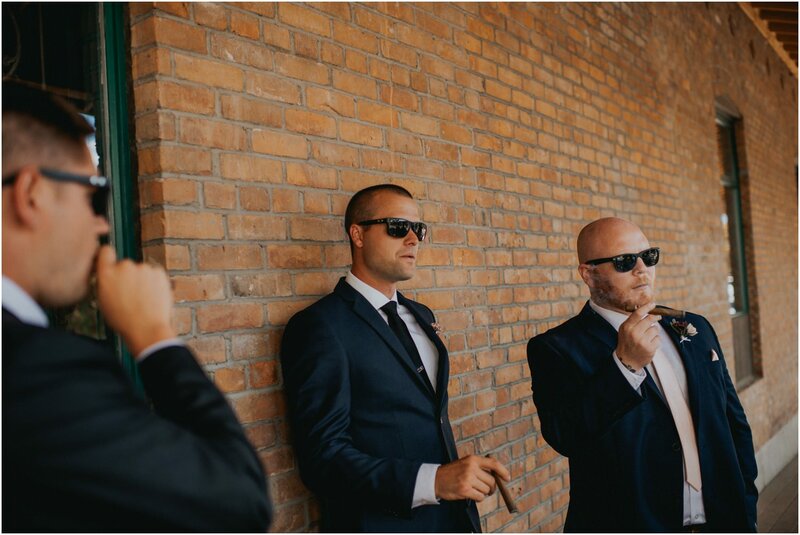 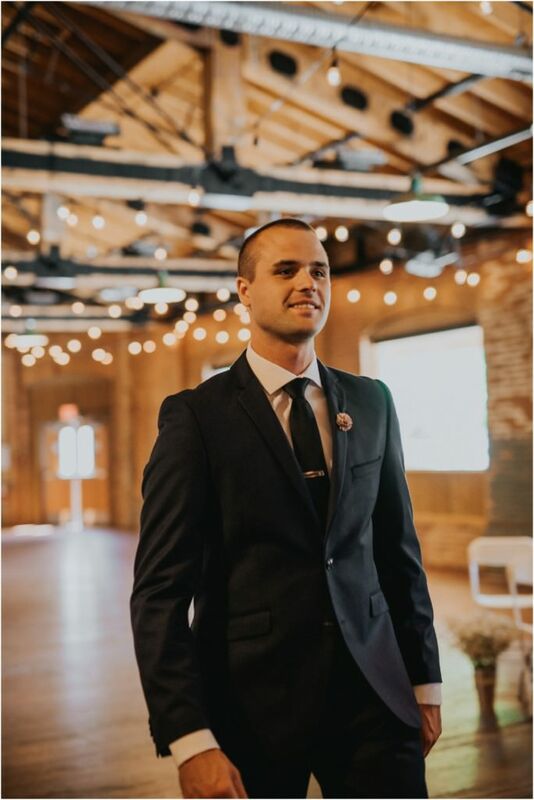 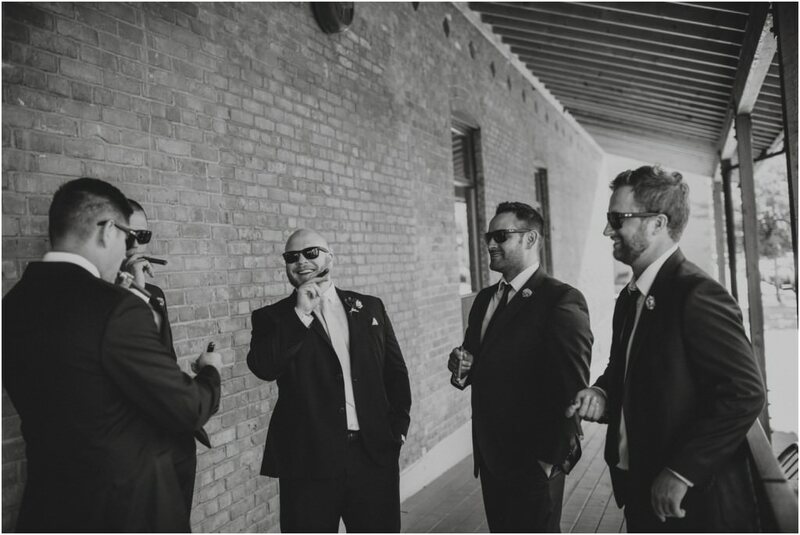 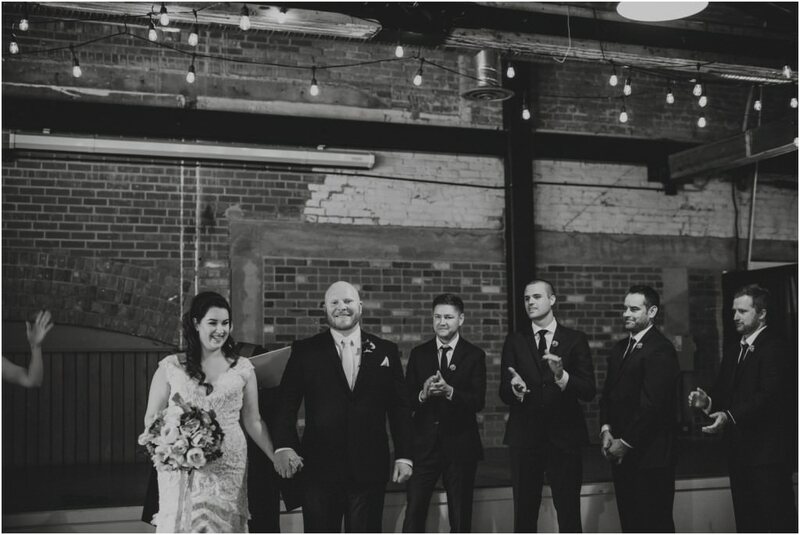 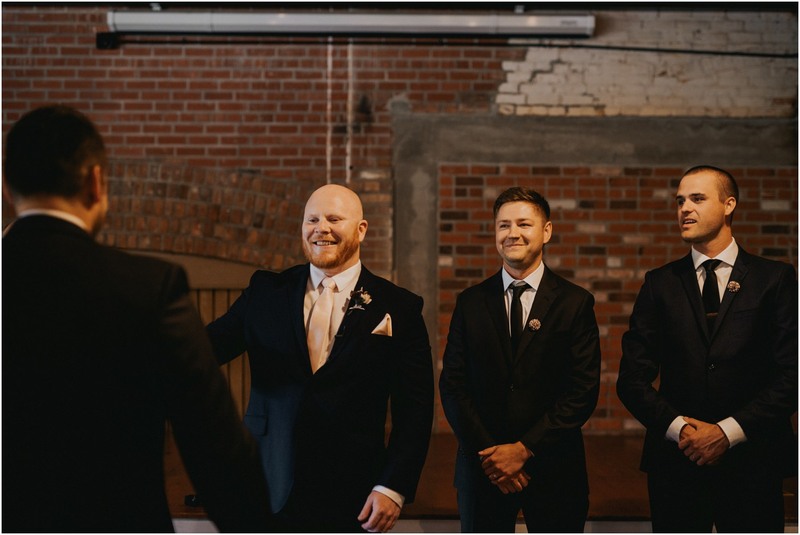 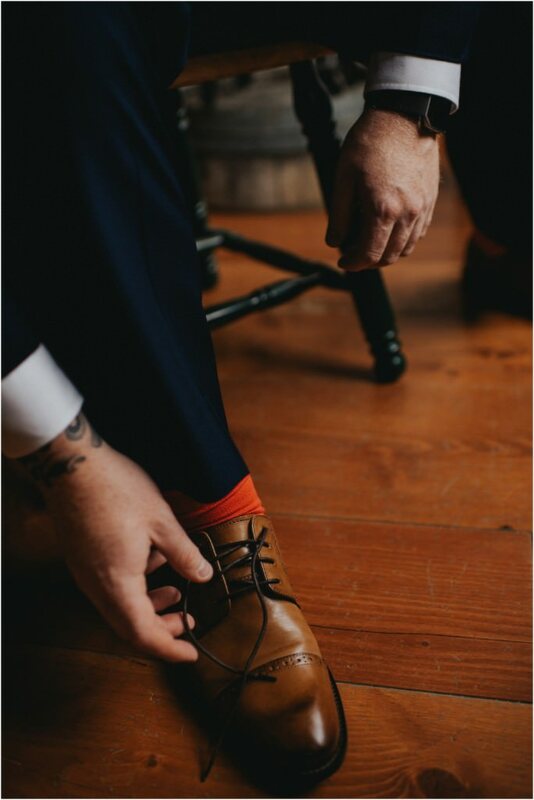 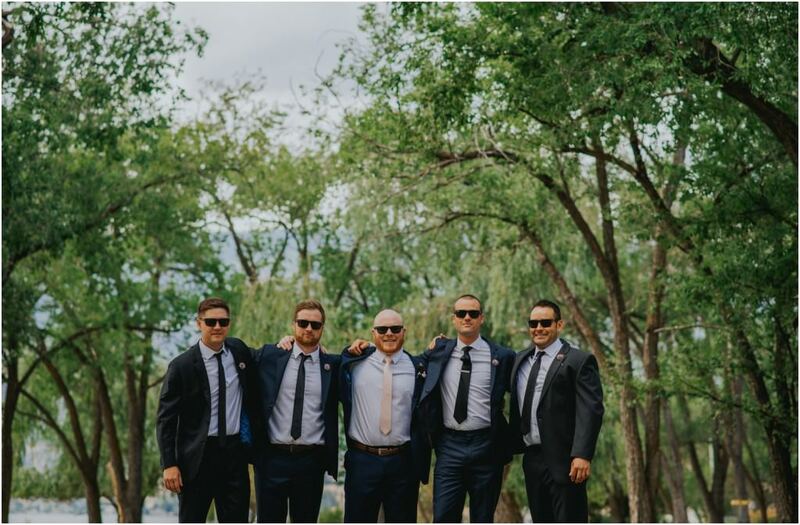 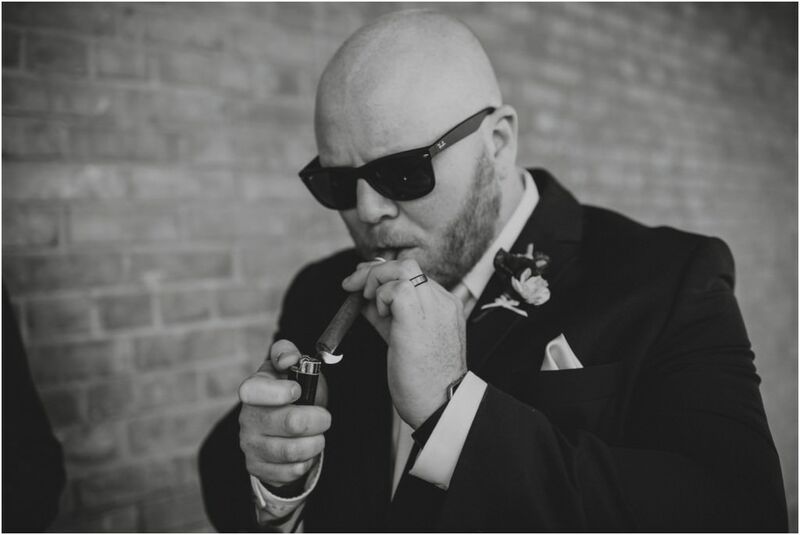 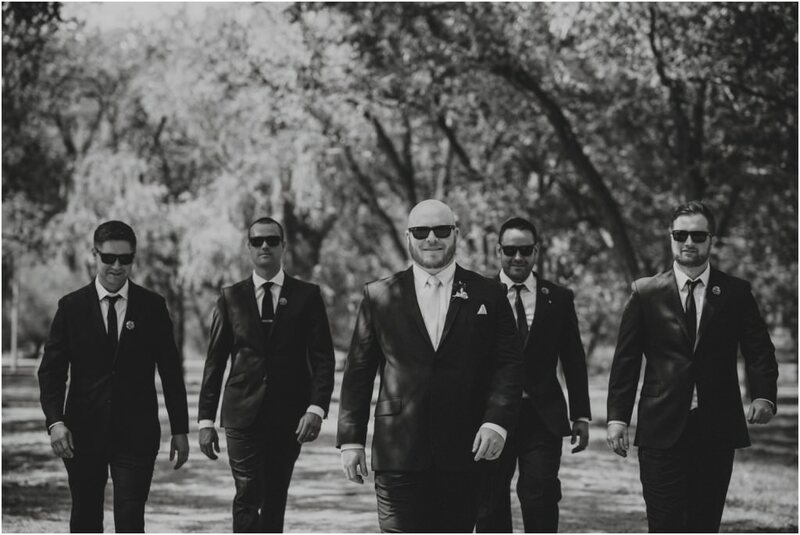 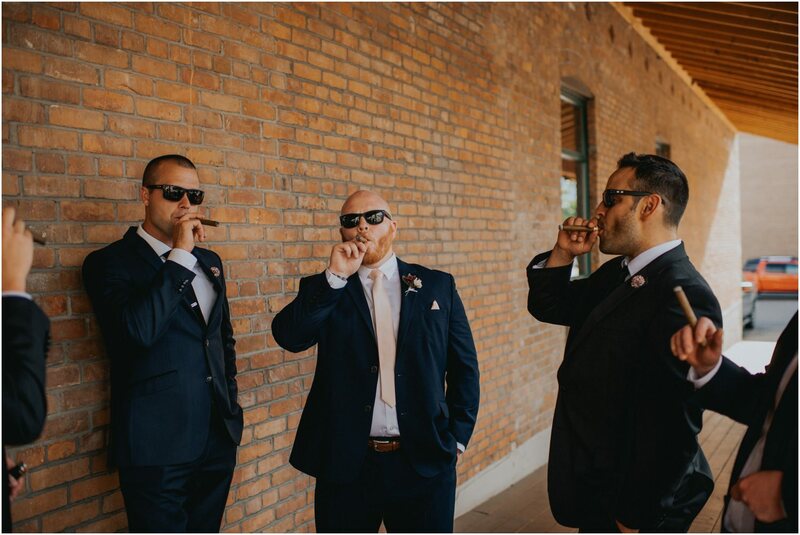 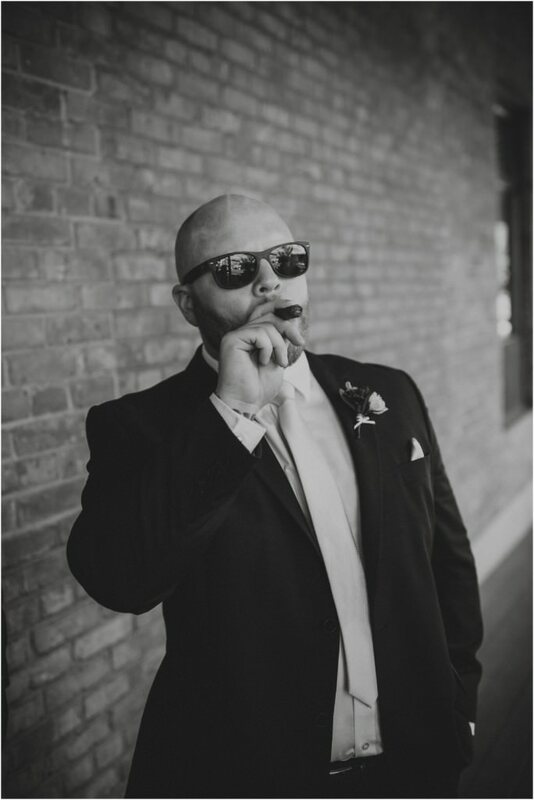 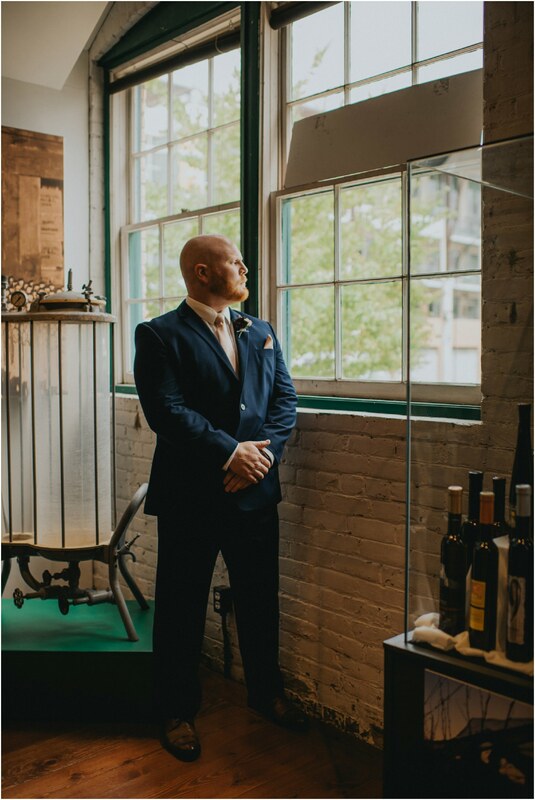 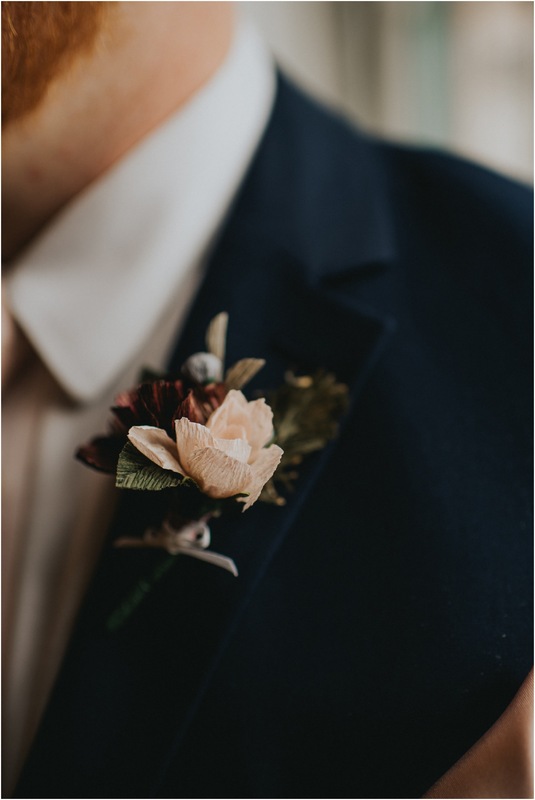 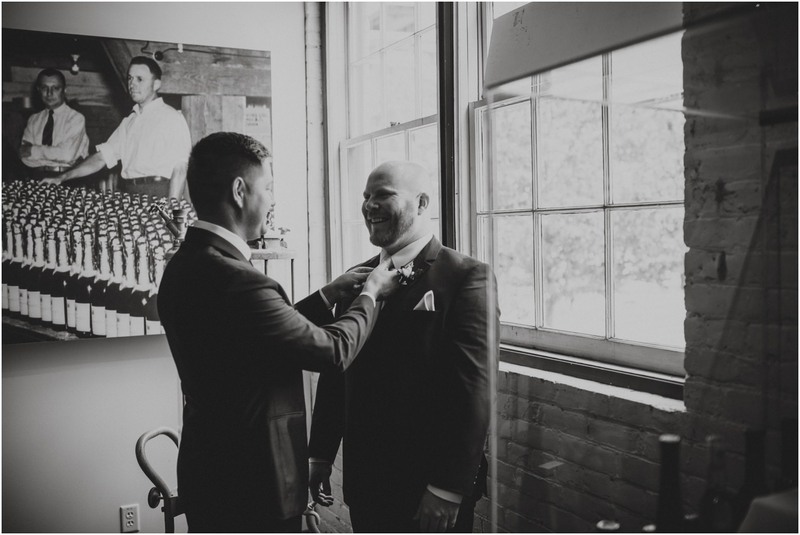 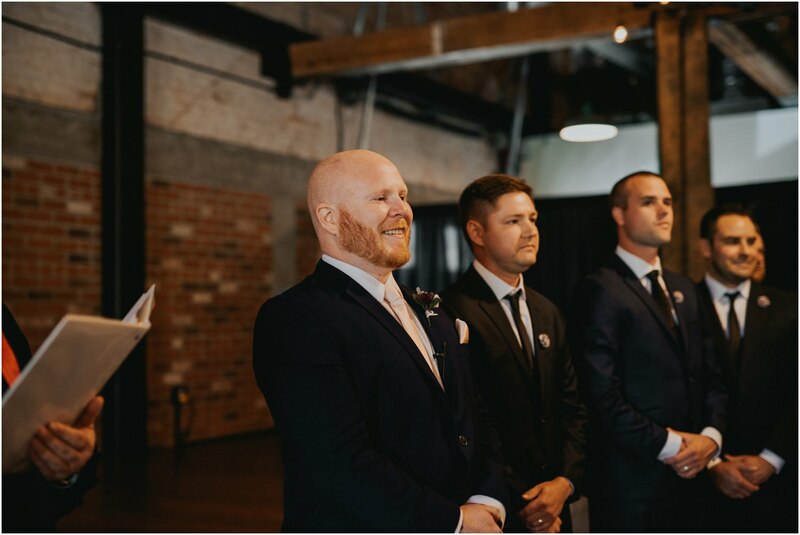 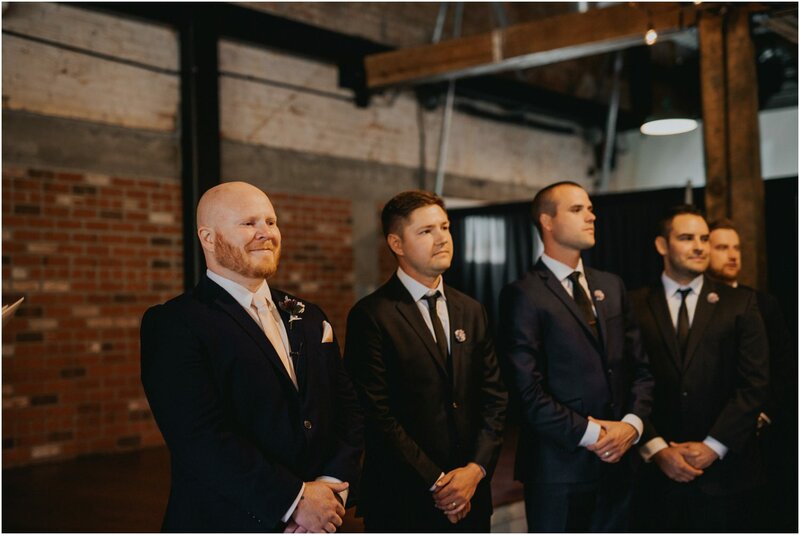 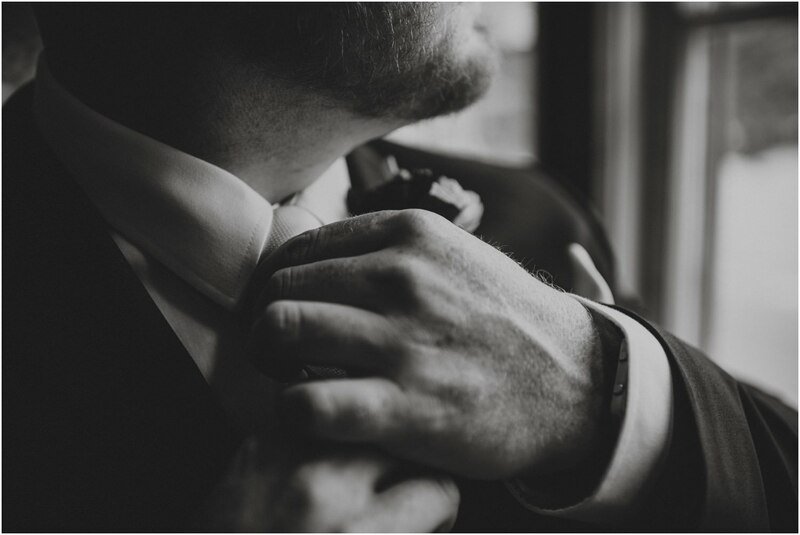 We headed back to the Laurel Packing House as Brian had cigars to share with his groomsmen before the night filled with music, good times, and dancing! 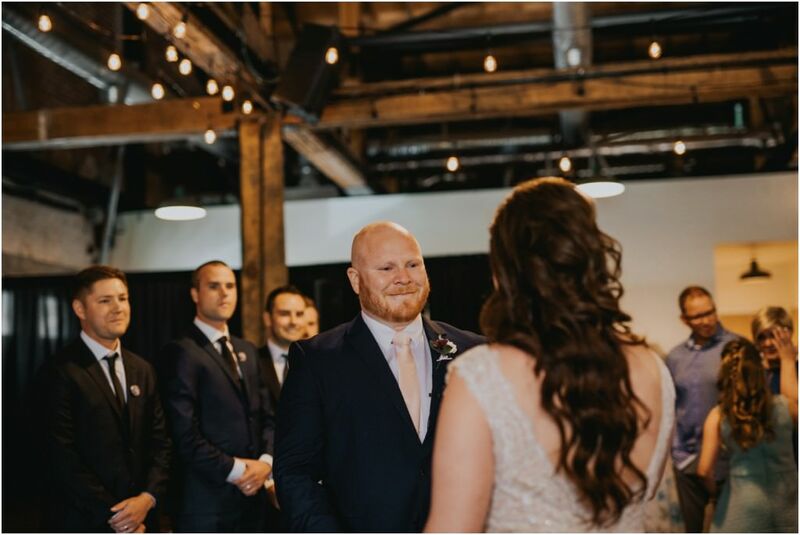 I actually met Brian and Katie the day of their wedding day, yet it feels like I’ve know them for so much longer. 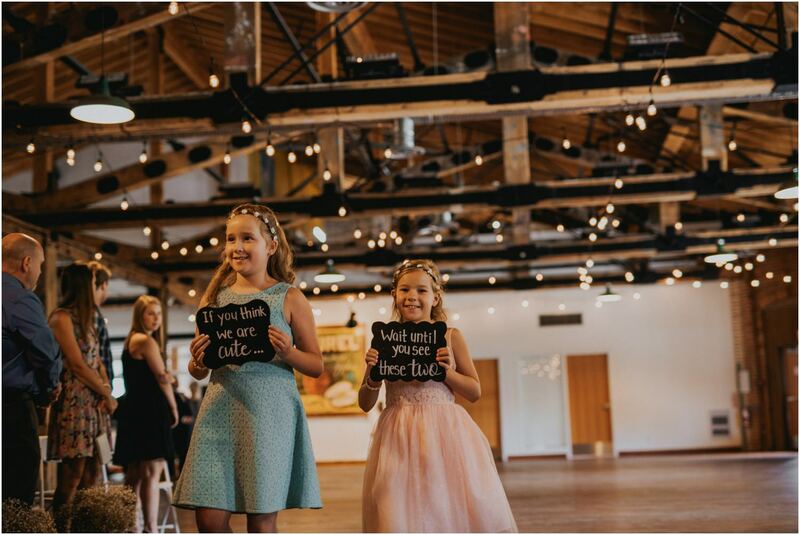 That’s definitely the kind hearted characteristics of them that will make you feel that way. 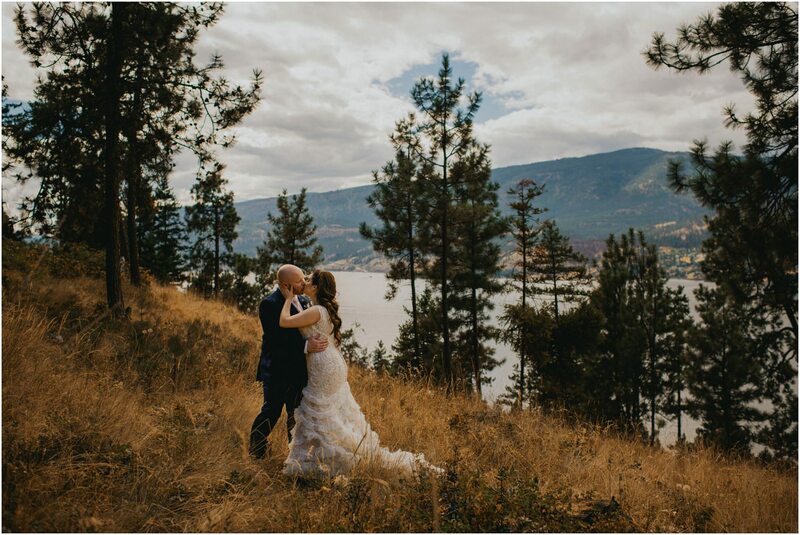 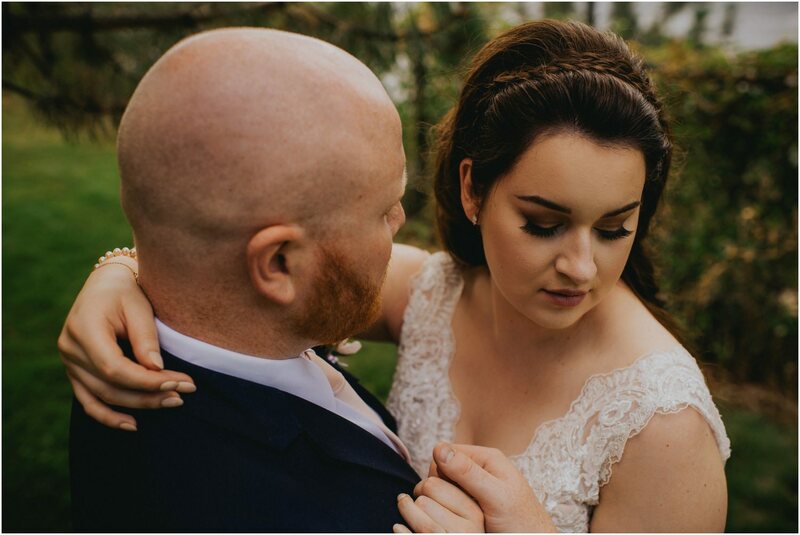 Guys, it was an absolute honour to adventure around with you on your wedding day photographing it all, thanks for being so awesome!